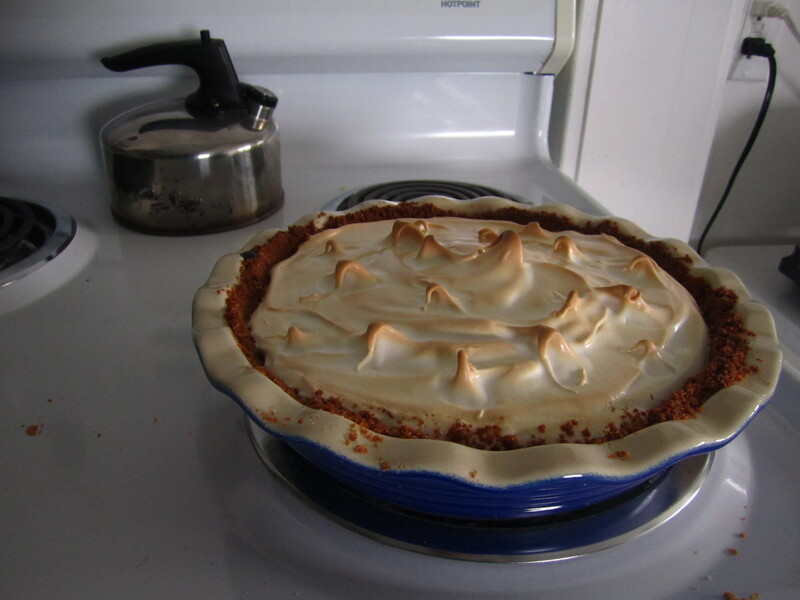 However, it seems like I’ve “come of age” and it is my turn to prepare the pie. 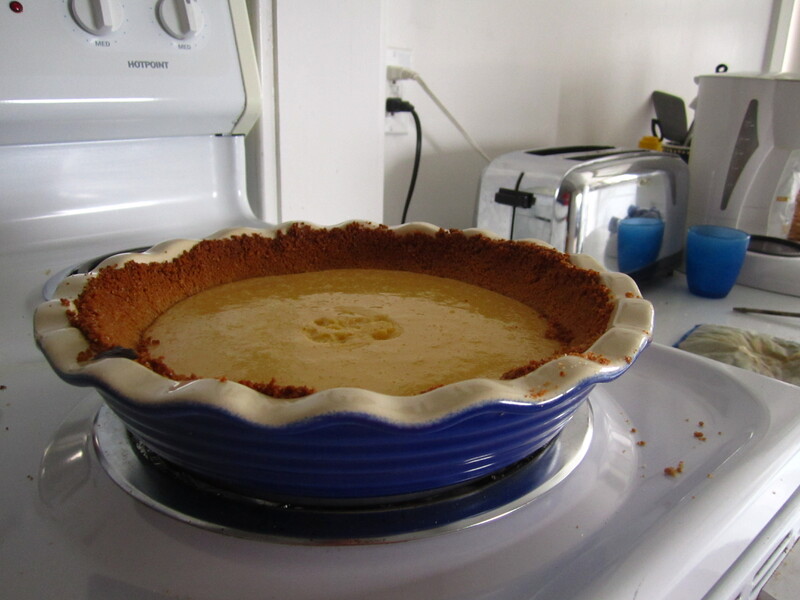 Rather than being filled to the brim with fruit and covered with a sheet of dough, this pie features a custard filling and an open top. 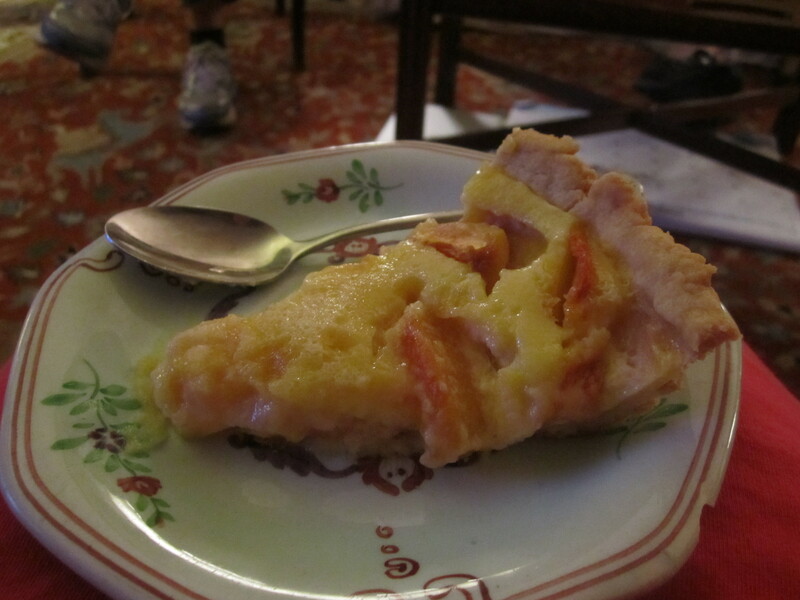 Lots of peaches are (of course) welcome, but too many will change the nature of the custard and the filling. Preheat oven to 425F. Put all the ingredients in a Cuisinart and mix until a ball forms. 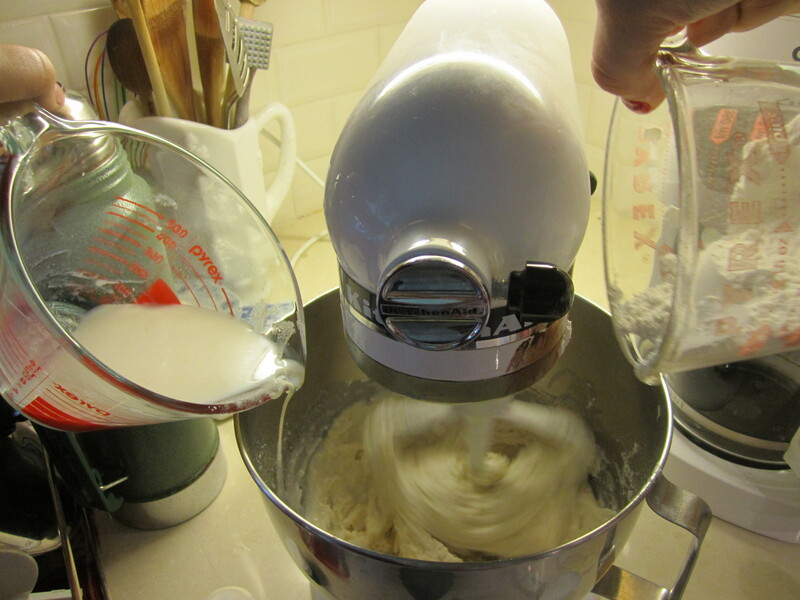 If you don’t have this fancy machine, use your fingers OR a fork and mix until the dough is uniform and easily malleable – rather like sugar cookie dough. Grease the pie pan. Press this into the BUTTERED pie pan until you have an even layer all the way around. Place in oven and bake for about 10 minutes or until just starting to brown. Remove and let cool. Reduce the oven temperature to 350F. 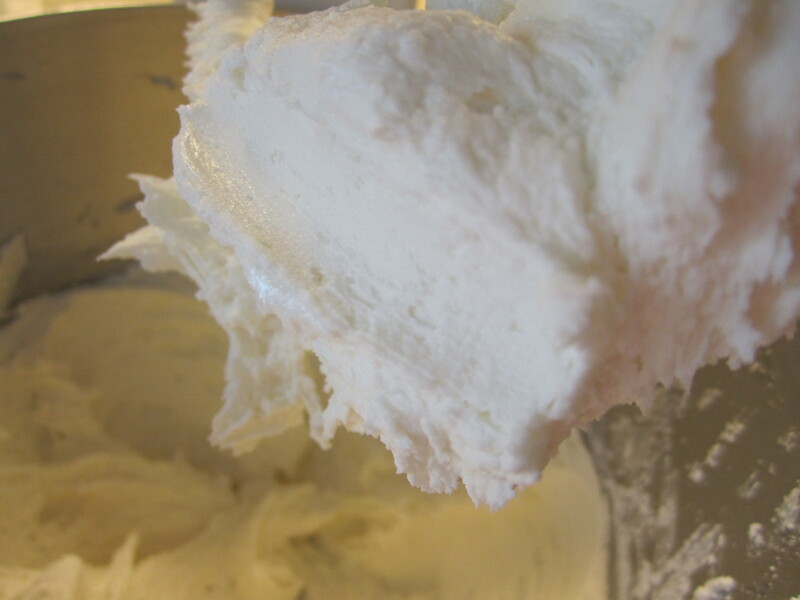 Beat all ingredients together until frothy and yellow and smooth. 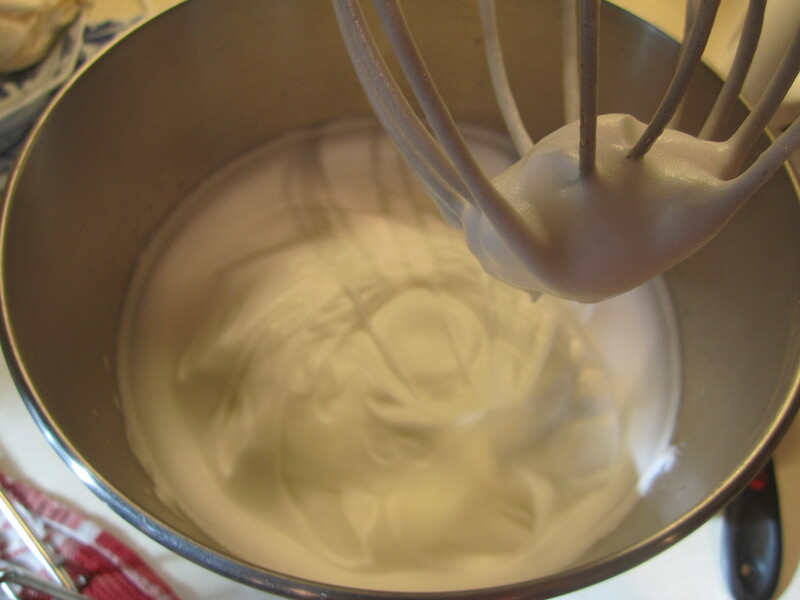 I put my mixture back in the Cuisinart, but this can easily be done with a whisk. 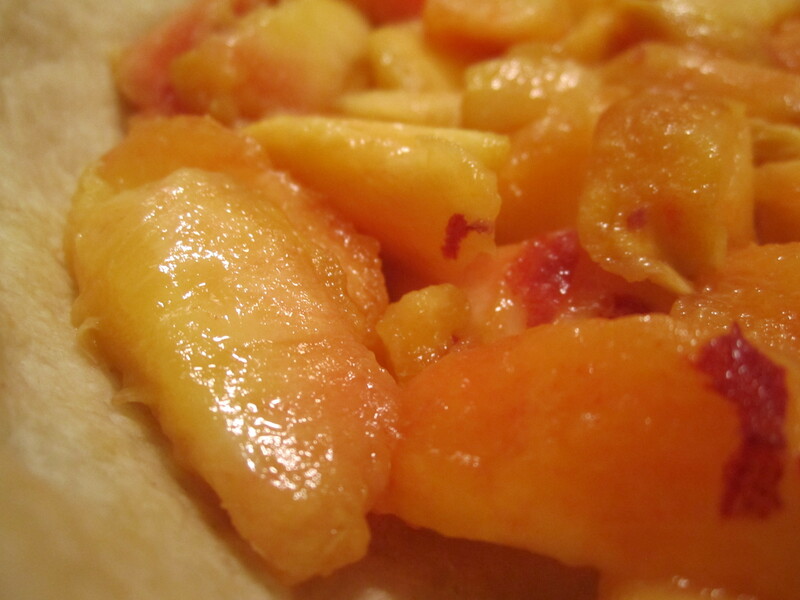 Peel and slice five small peaches (three large ones) and place them in the pie dish. This is an opportunity to be artistic…and normally, I am…but when you have an aunt hovering in and out of the kitchen, a mom checking on certain elements of the pie, an uncle and a father attempting to grill (but not cooking the chicken enough) and an adorable little grandmother who is repeatedly asking you what day it is…you just want to finish the pie and get out of the kitchen, seeking refuge in the piano room…or is that just me ? 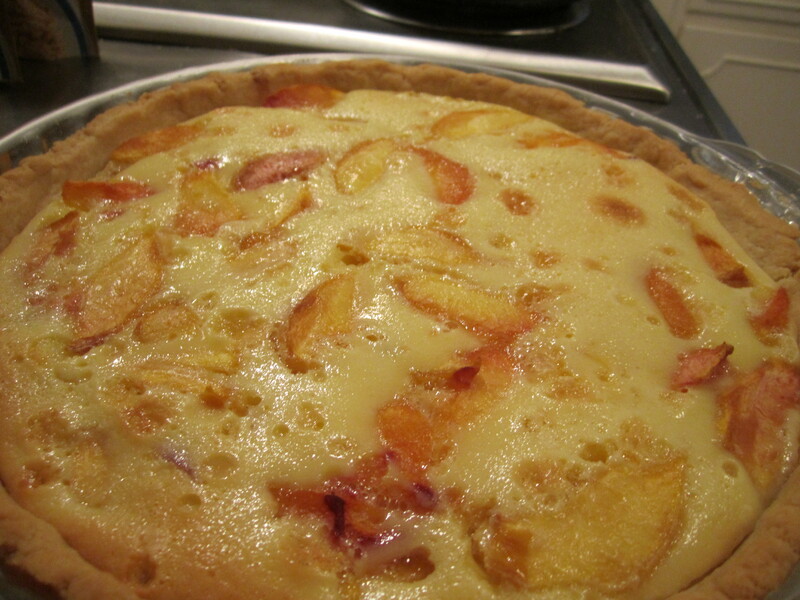 Anyway, place the peaches in the pie pan, arranged as you see fit. 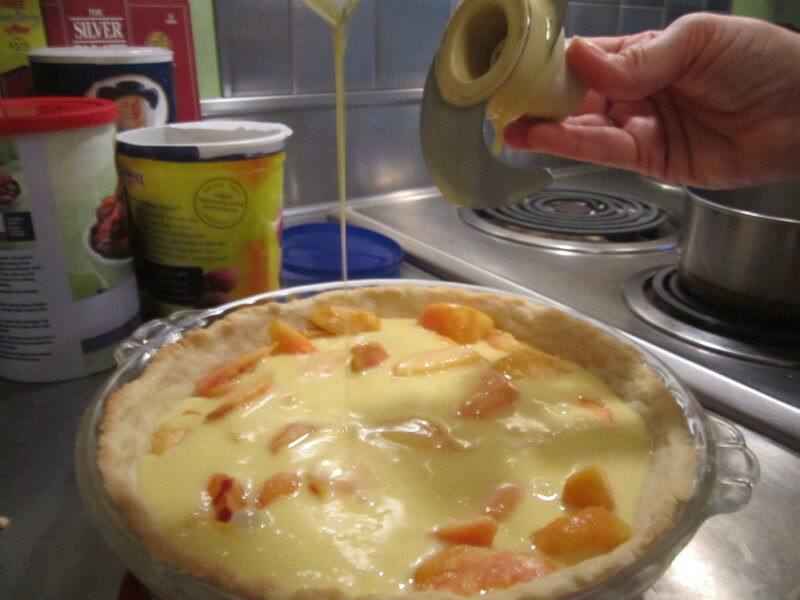 Pour the egg mixture (eg the custard) on top of the peaches. 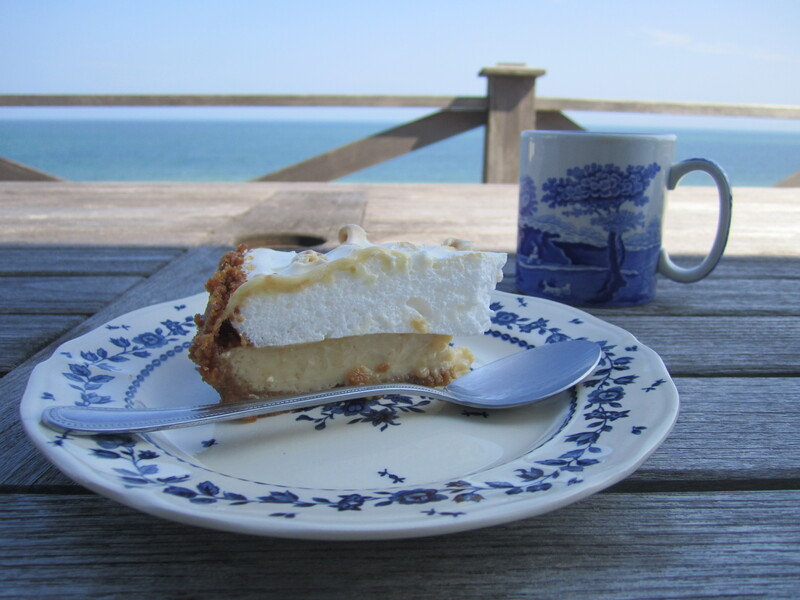 I didn’t have any with me…but I think that sprinkling a little nutmeg overtop of the pie would be super delicious. Maybe a little cinnamon, too. Bake for about 35-40 minutes or until the custard is set. 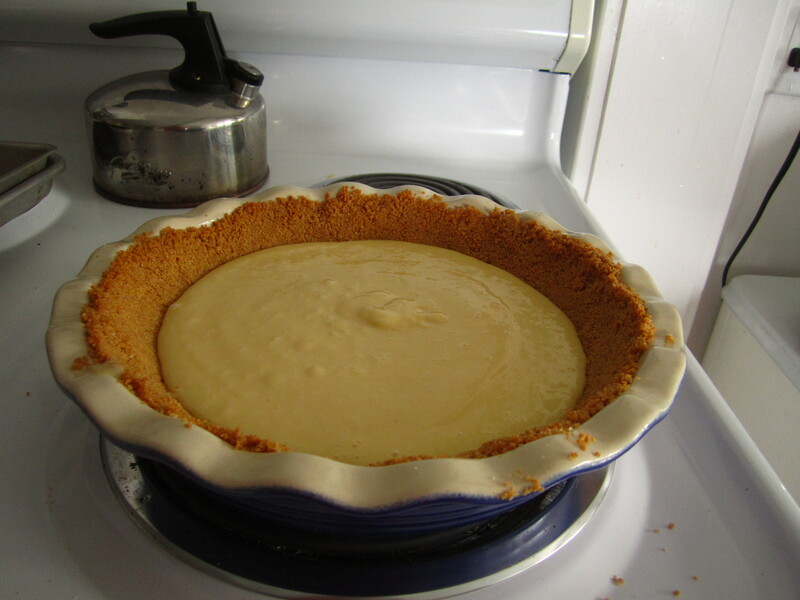 You’ll know when the custard is cooked when you can touch it with your finger and a small amount will come off OR when you shake the pie and the center will jiggle rather like pudding but not actually pour/spill. 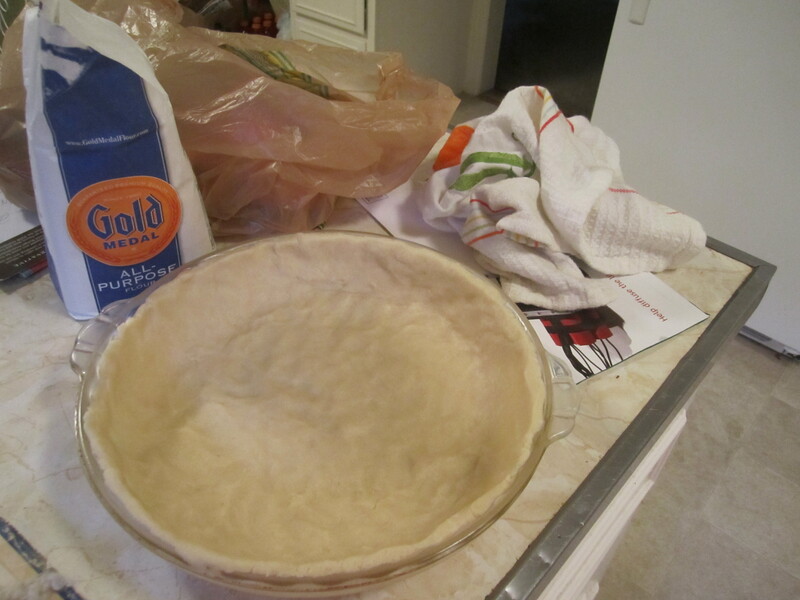 If your pie crust starts to burn (depending on the strength of your oven), cover the pie with tinfoil. 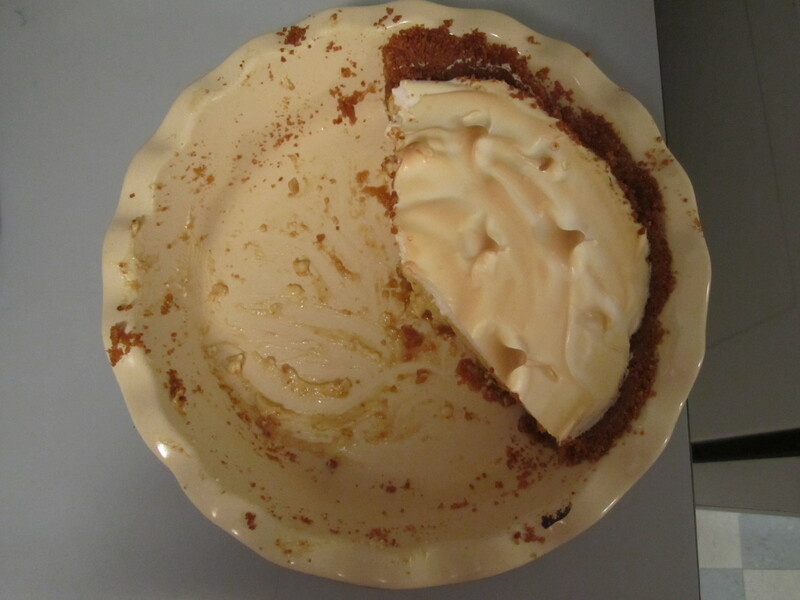 I would serve this pie warm rather than cold. This way, the custard is so much more creamy and comforting. It’s a great summer dish best enjoyed outside on a picnic table (or in front of the Olympics…) It’s also fantastic the next day….I just ate the leftovers. Miam miam ! Well ! What a pleasant surprise ! I couldn’t believe my eyes when I saw that I’d been nominated for the “Versatile blog award” – I’ve only been posting (consistently) for a few months now, so I figured something like this would probably never occur…but look – here we are ! Thank you so much, at350degrees.wordpress.com ! I am quite flattered. -My feet aren’t petite but I like them that way. 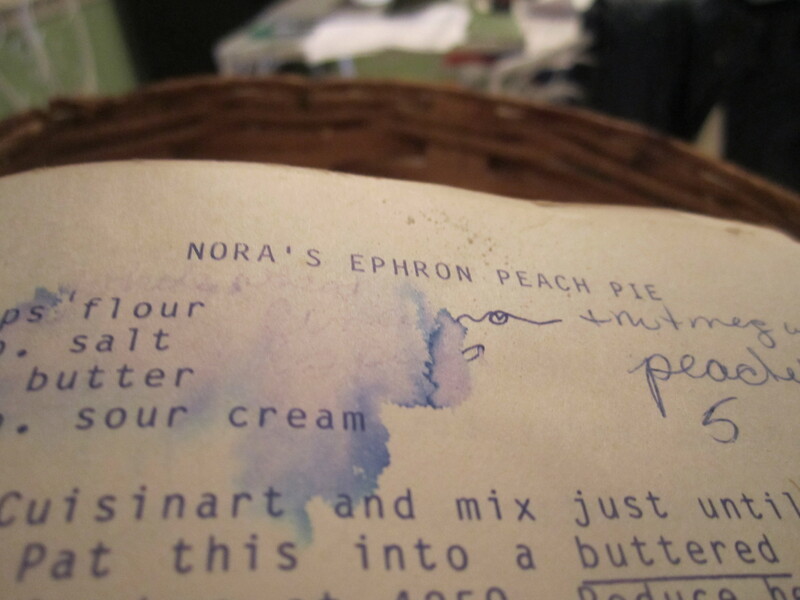 -A white piece of printer paper and a papermate blue pen are my two most important kitchen accessories – it’s how I note all of my recipes in my cookbook. -I “do voices”…as in, imitations. Famous people, made-up characters, friends…teachers…enemies…anything ! 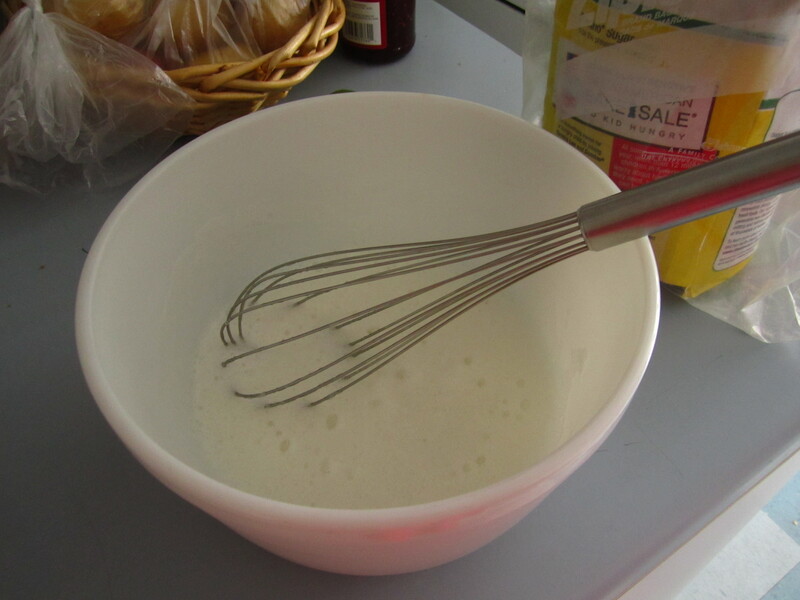 -Often, as I am without many helpful electric appliances, I whip and whisk everything by hand. -I am fluent in French (well…mostly…) though have zero French blood in my body…vive la France ! Well ! I think that’s enough about my habits and personality – thanks again at350degrees ! My sibling loves chocolate. In fact, I think she loves chocolate more than anything else on the face of the planet. Except for stuffed animals. And Doctor Who. Maybe. In any case, she celebrated her birthday just the other day and I was (naturally) in charge of the cake. She told me she wanted chocolate and raspberry to be involved…but other than that, I had free reign. In all honestly, I was just going to make a straight-up double-chocolate cake with raspberries on top. 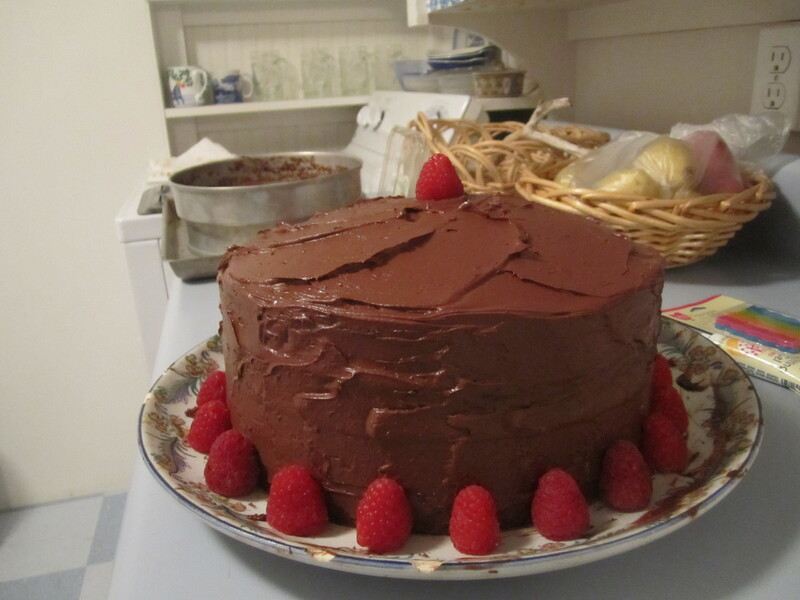 You know, chocolate cake, chocolate buttercream, raspberries. BOOM. But…then I got to thinking. I could make a raspberry filling. Hmm. And all that chocolate needs some variation. Maybe I could make a feuilletine-type layer, with a little crunch for “texture,” as they say on all of those fancy cooking shows (that I adore watching). And we were off to the races. 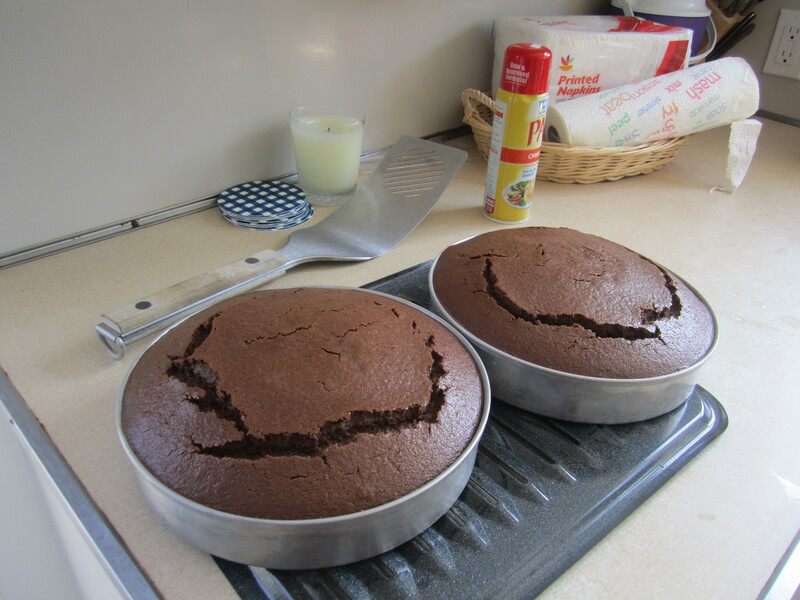 I ended up making two round layer cakes of regular chocolate cake. 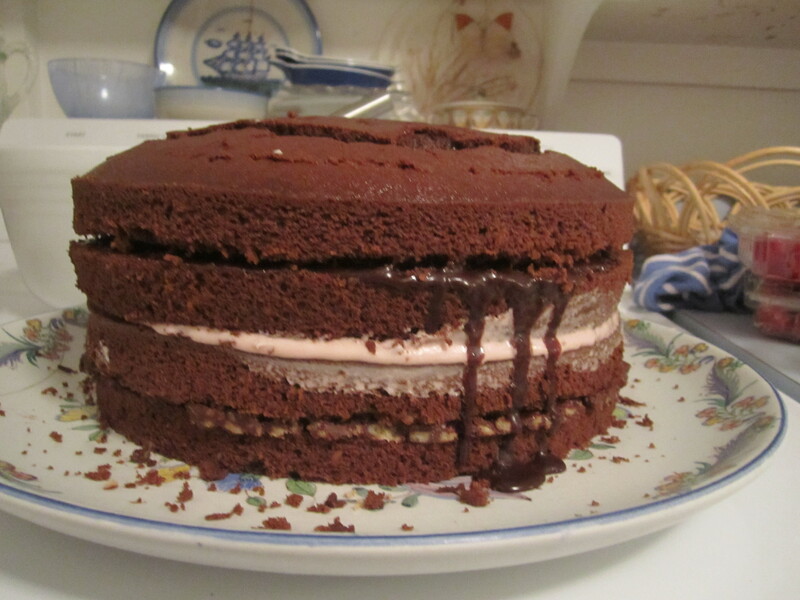 I cut each layer in half and put a different filling on each layer, one being a chocolate cookie crunch (feuilletine), a raspberry buttercream, and a dark chocolate raspberry ganache, finally smothering the entire gateau in chocolate buttercream. And lining it in fresh raspberries. Need I add that it was about 90F outside and there is no AC here in da kitchen. The chocolate melted all on its own…. 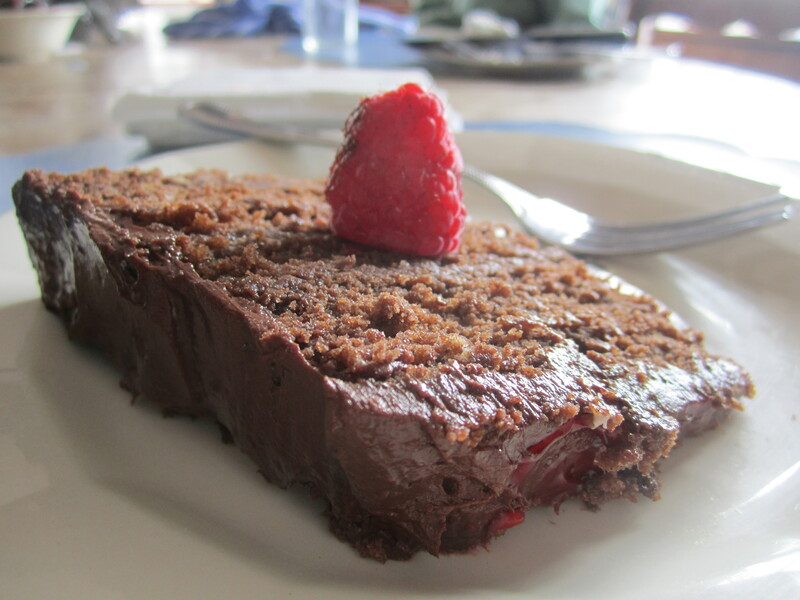 I don’t really have a name for this cake…so “Chocolate Raspberry Crunch” is a working title. Any suggestions are MORE THAN WELCOME . Also, given the experimental nature of this cake, I do not have specific measurements for the fillings. I’ve given approximations, but know that you may need to change the amounts if you (dare?) 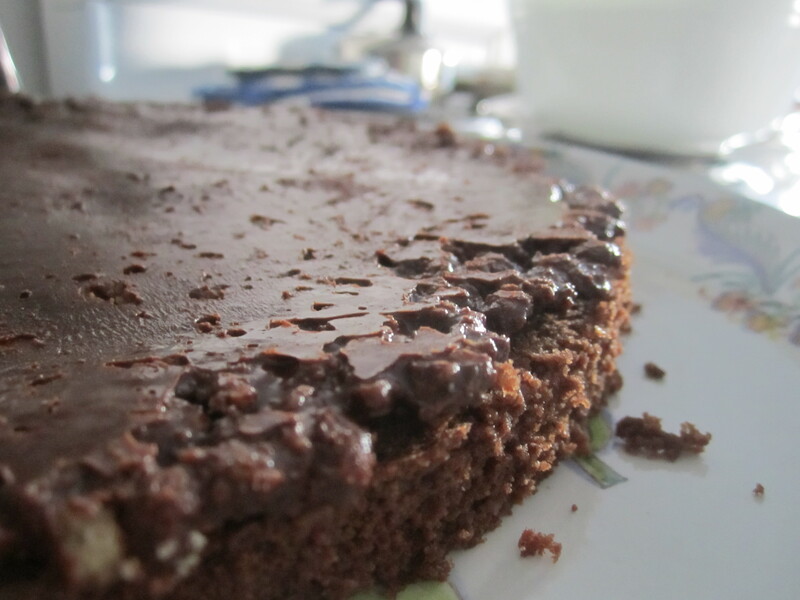 attempt this delicious, decadent and dangerous torte. For the cake : look on the back of a Trader Joe’s cocoa box ! Preheat oven to 350F. 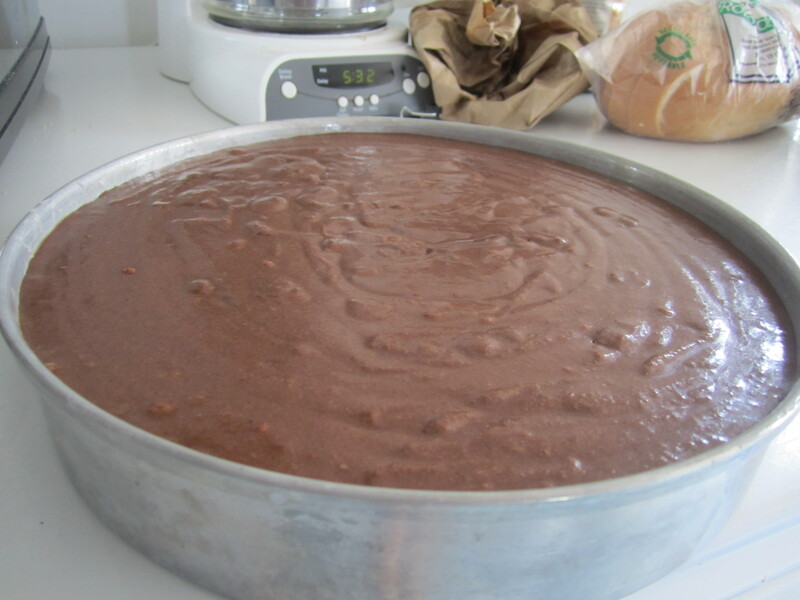 Prepare two 9-inch round cake pans. 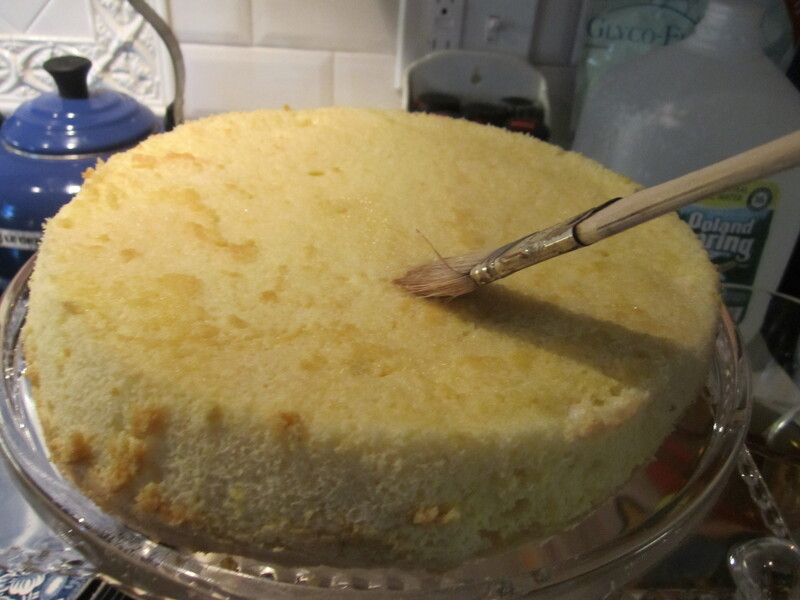 Know that this cake does sometimes make extra batter – the pans I normally use are a little small, so I often have a little leftover. 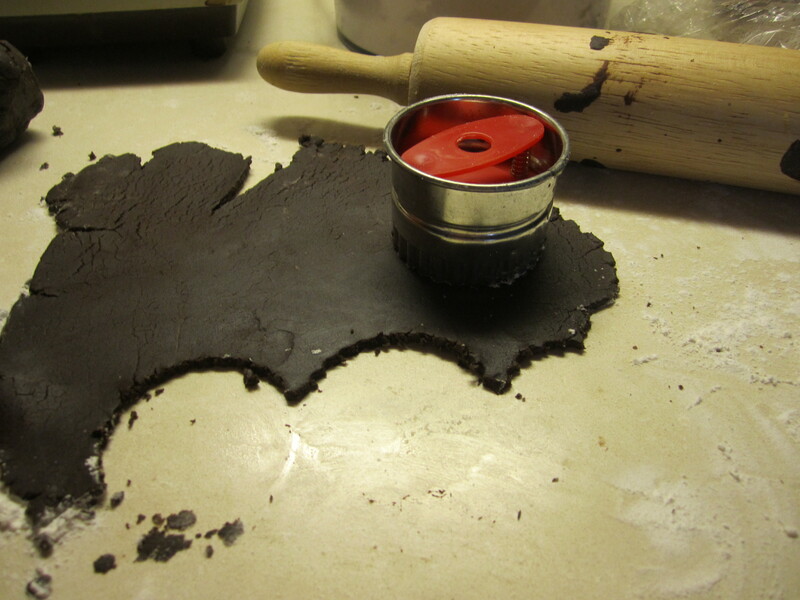 If you use pans with a removable bottom (like I did this time), all the batter will fit. Crack the eggs into a large bowl. Cream together the EGGS and the SUGAR until you reach the ribbon stage. For more information on ribboning, please scroll down to the Fraisier post. 🙂 Add the milk and vanilla and mix until smooth. 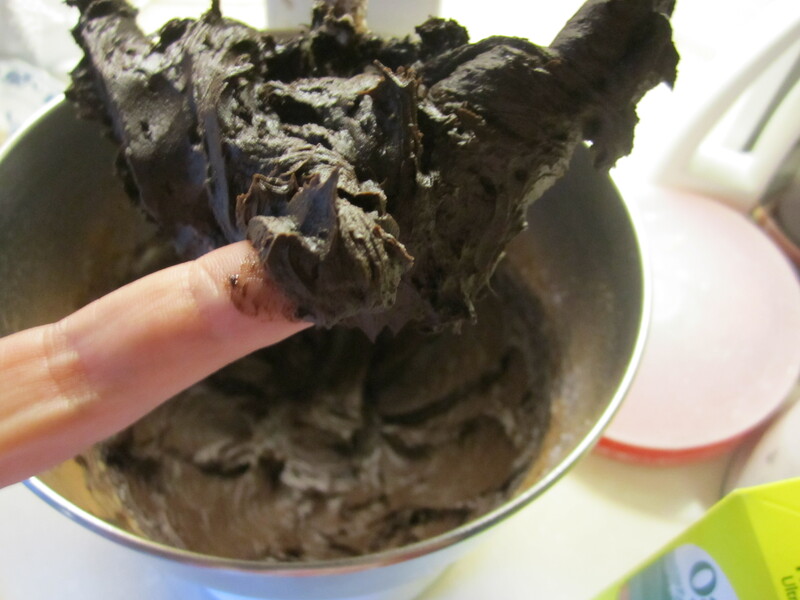 In medium pot, melt the butter and stir in the cocoa powder until it looks like velvet. Yes, velvet. Pour the batter into the prepared pans and place in oven. Let cook for about 45 minutes or until springy to the touch. Remove and let cool. 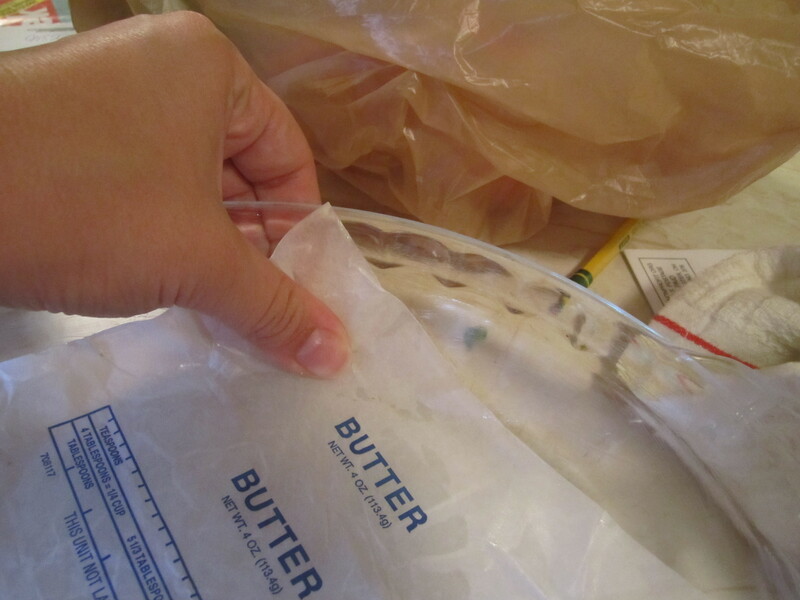 Prepare a jelly roll pan by covering it with tin foil (or parchment, or wax paper…whatever you prefer). I placed mine in the freezer to cool it off. 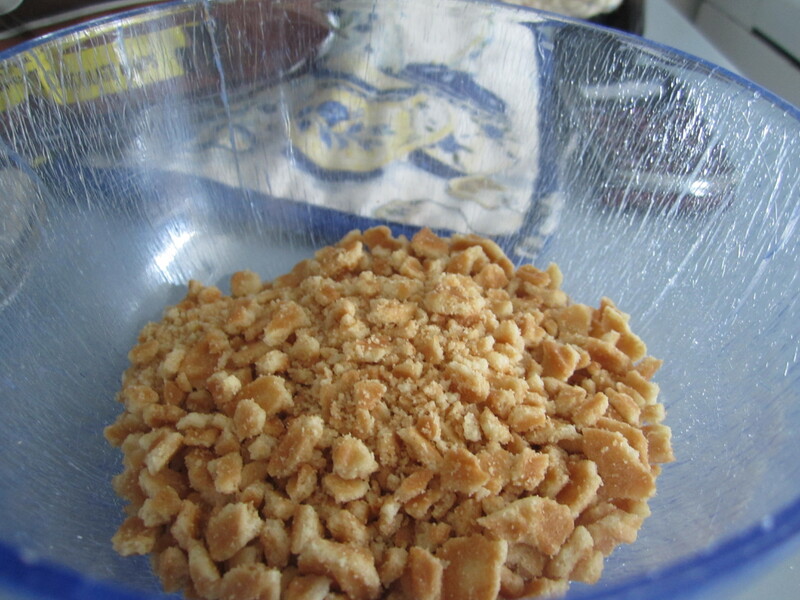 Put the cookies in a small plastic bag and beat with the back of a spoon until nice and crushed. 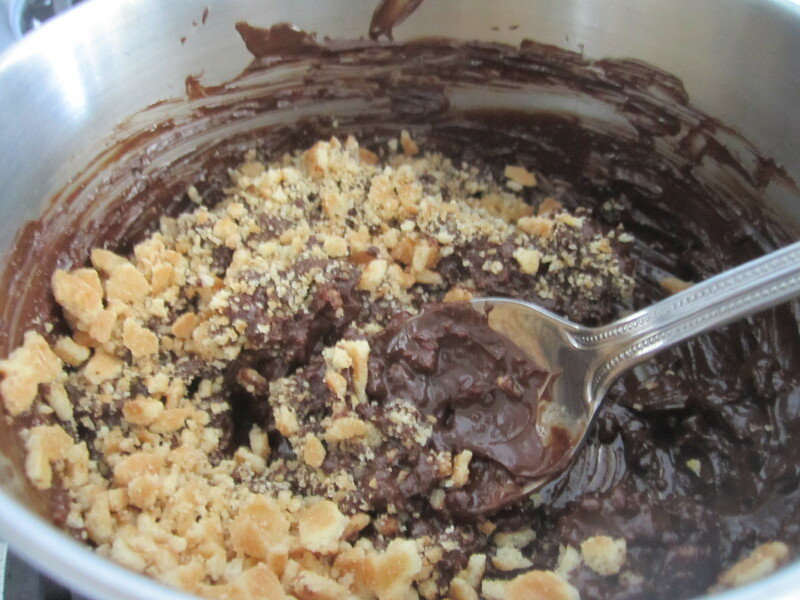 In a separate pan, melt the butter and the chocolate chips, stirring until smooth. Pour the cookie crumbles into the pan and stir until they are covered in chocolate. Pour the chocolate mixture on top of the jelly roll pan and, using the back of a spoon, spread it until it is as thin as possible. 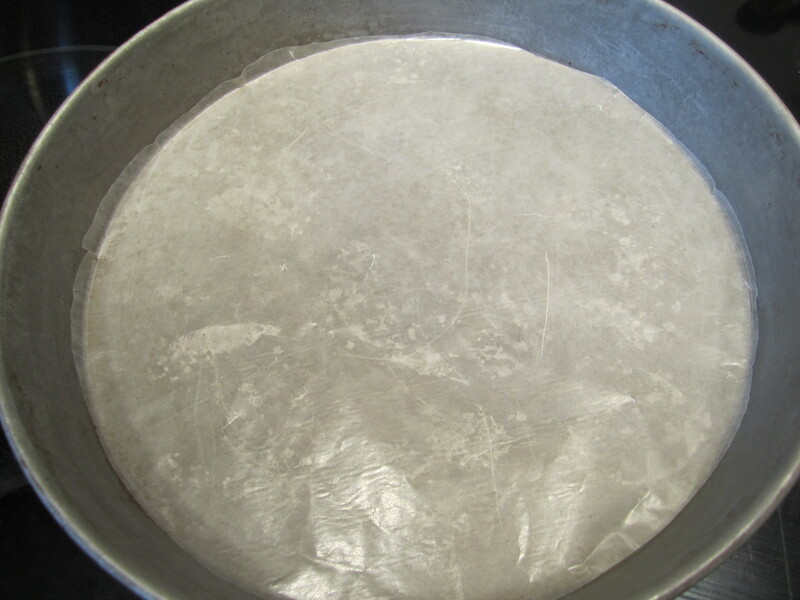 I made mine into a circle, guestimating the size of the 9” pan. Place this in the freezer to chill/set. In a large bowl, cream the butter. Add the raspberry syrup and taste for raspberry flavor. Add sugar until the butter taste has diminished. Set aside. 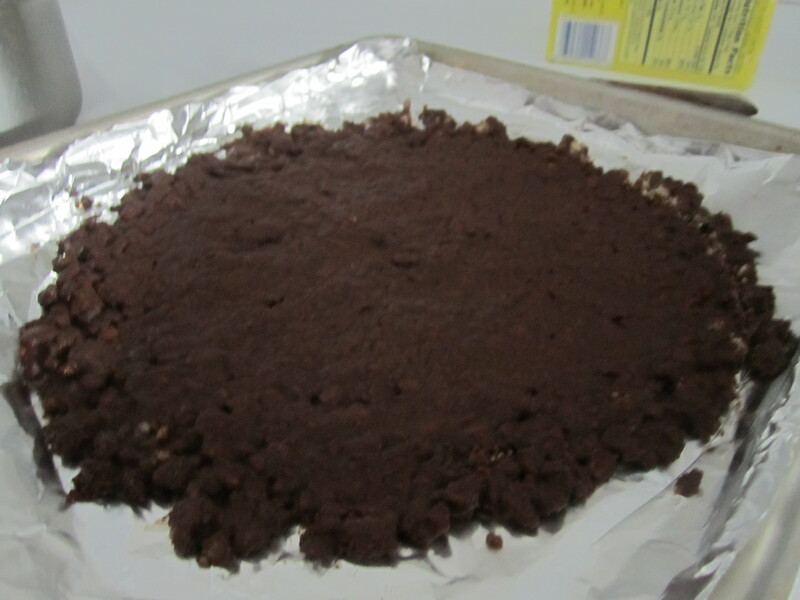 In an effort to minimize dirty dishes, I re-used the pan in which I melted the chocolate for the crunch layer. 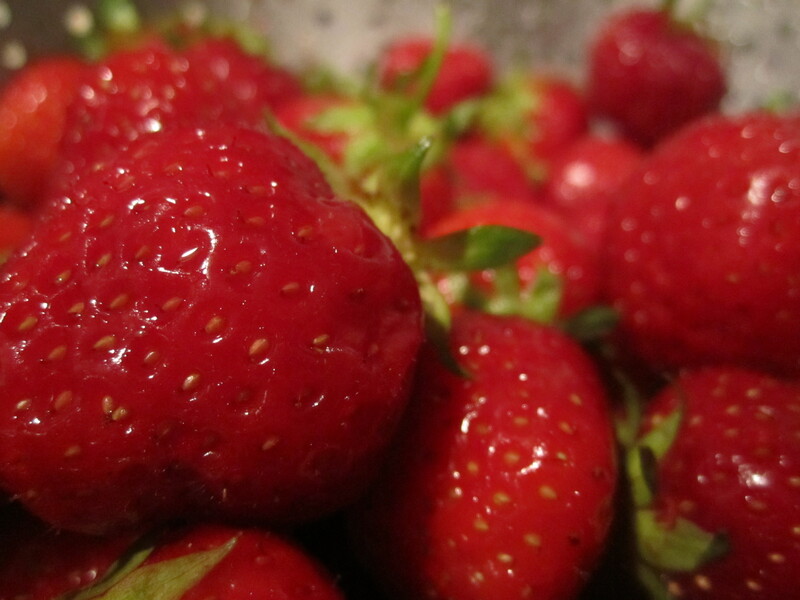 If you do the same, start by adding the raspberry syrup and whisking over high heat. Bring that syrup to a boil. Add 1 tbsp cream and continue whisking. When hot hot hot, remove from heat and add the chocolate chips. 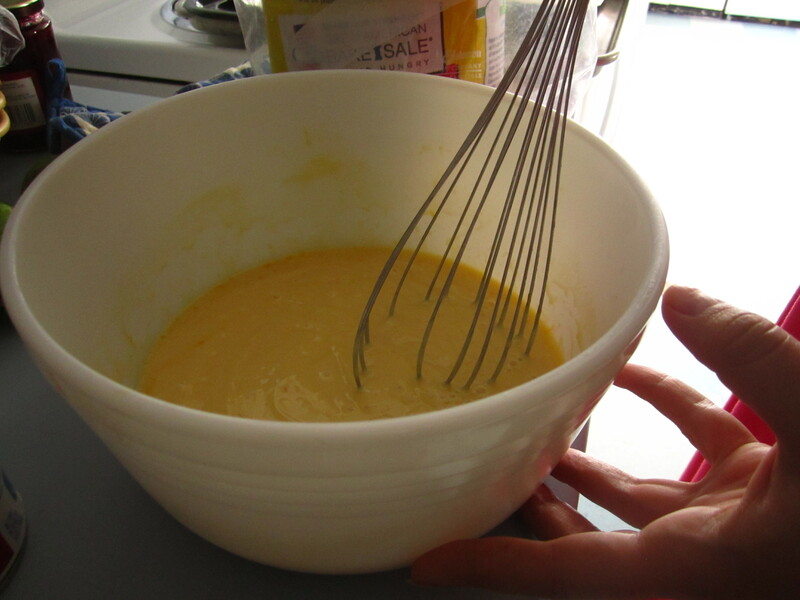 Let sit 1 minute before whisking together to combine. Add another tbsp cream and taste. It should taste like a lindt raspberry truffle. Add more chocolate or raspberry or cream to adjust the flavor as you like it. The mixture of the syrup and chocolate is surprisingly forgiving and can take a fair bit of variation. Let cool in the fridge. 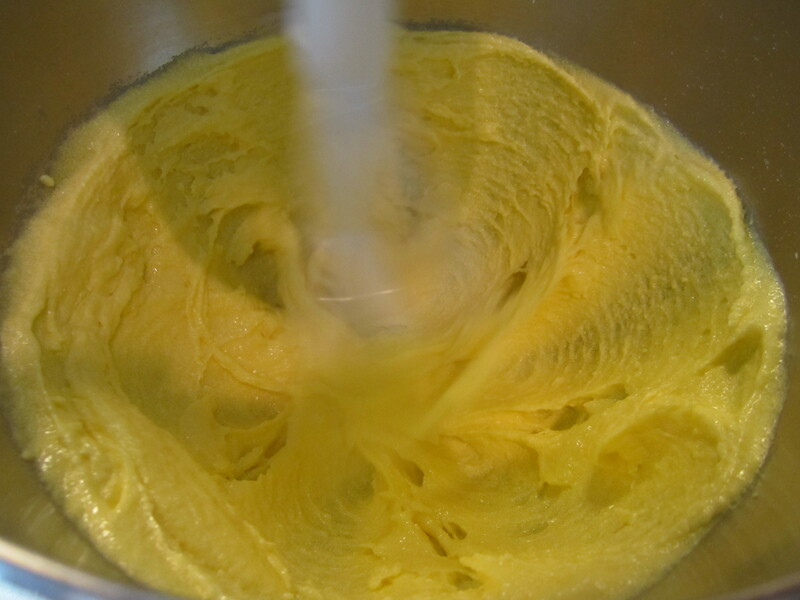 In a large bowl, whisk the butter until light and creamy. 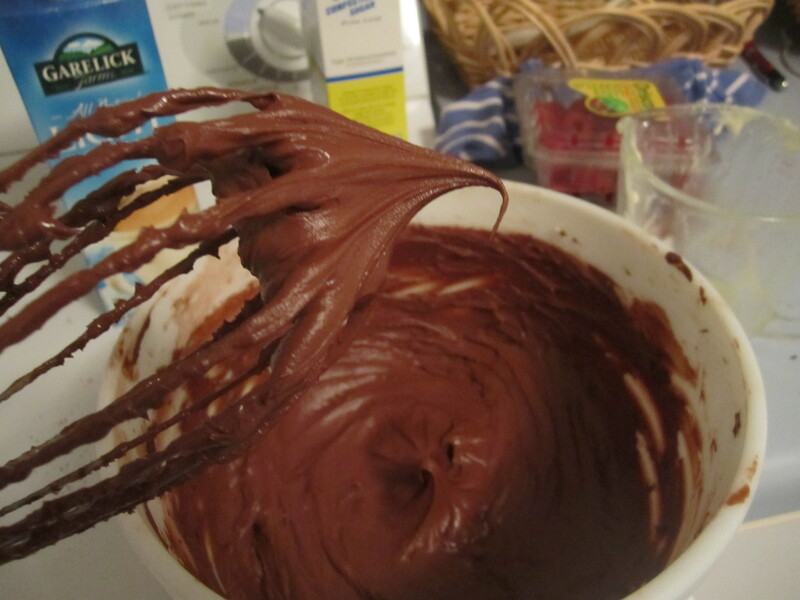 Add the cocoa and whisk again. Add sugar until the frosting is as sweet as you like. I make a very bitter frosting – I really like the deep and strong flavor of cocoa powder, so I avoid adding a lot of sugar. 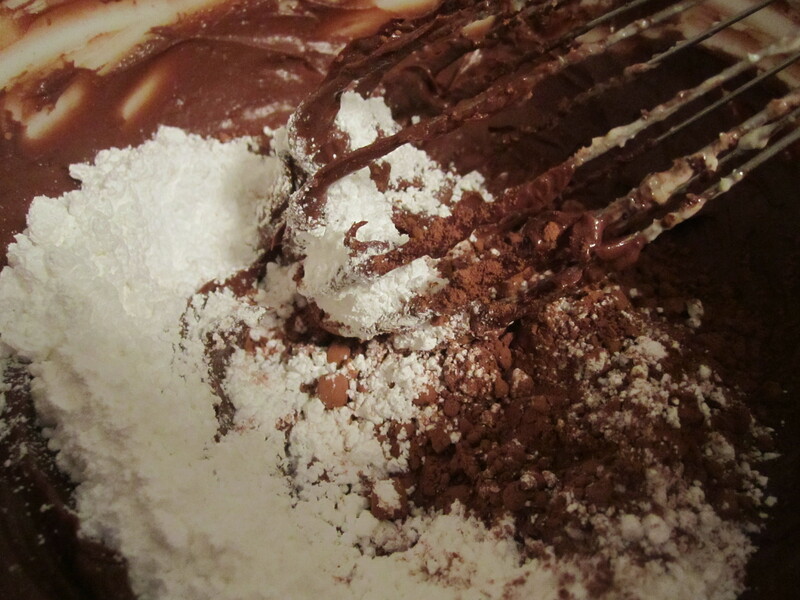 In fact, little note for everyone : when recipes state how much powdered sugar to add, I usually halve it. Too sweet ! This is a little tricky. 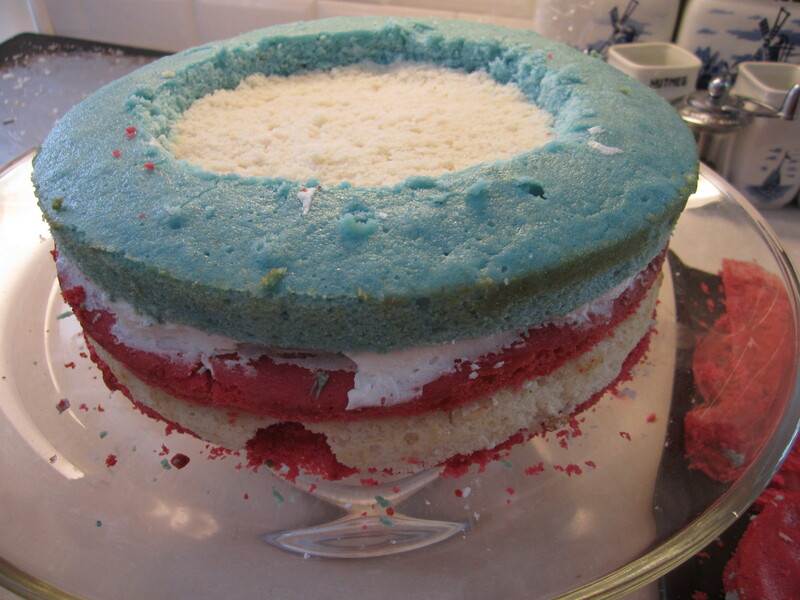 First, cut both layer cakes in half. 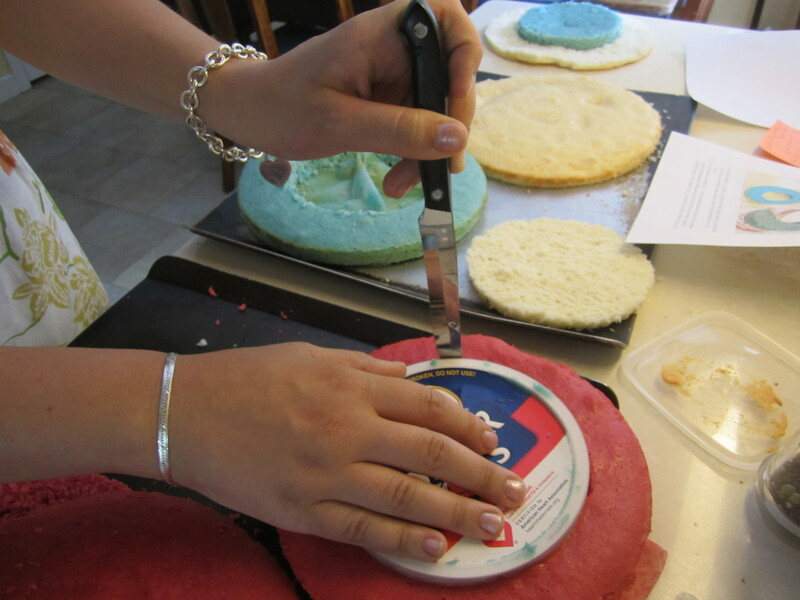 Place the bottom layer of one of the cakes on a large, flat cake plate. Get the crunchy layer out of the freezer and (bring to room temperature if possible. 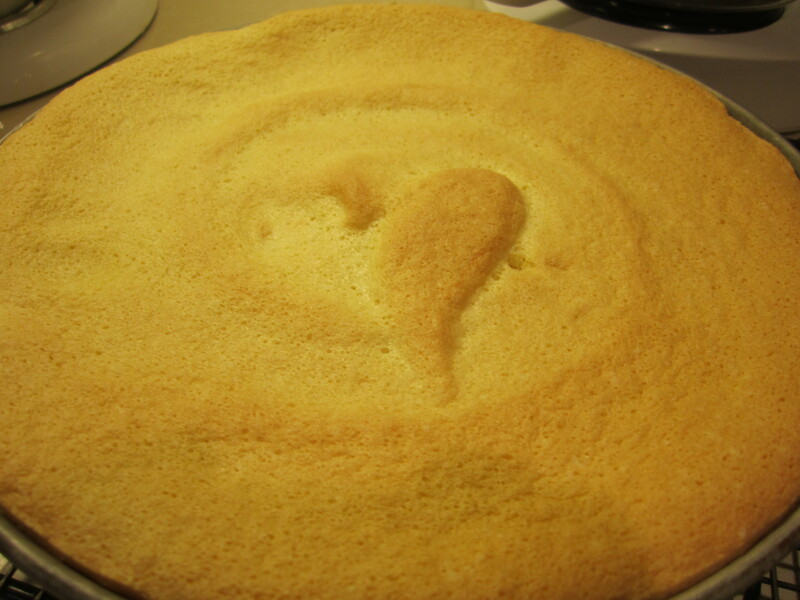 I didn’t have to wait long given the suffocating temperature of the kitchen) and place the empty cake pan overtop. Cut the feuilletine down to size, nibbling the leftovers. Place the chocolate layer on top of the cake and then peel the foil (or paper) off. Place the second cake layer on top. 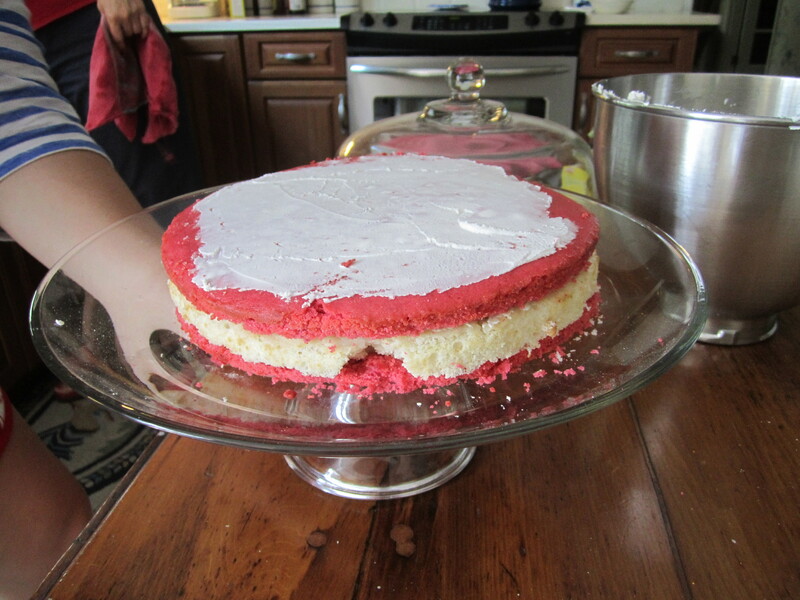 Grab that raspberry buttercream and spread that on top of the next layer. Leave a border without frosting – it will leak out as you put the other layers on. Cover with the third cake layer. 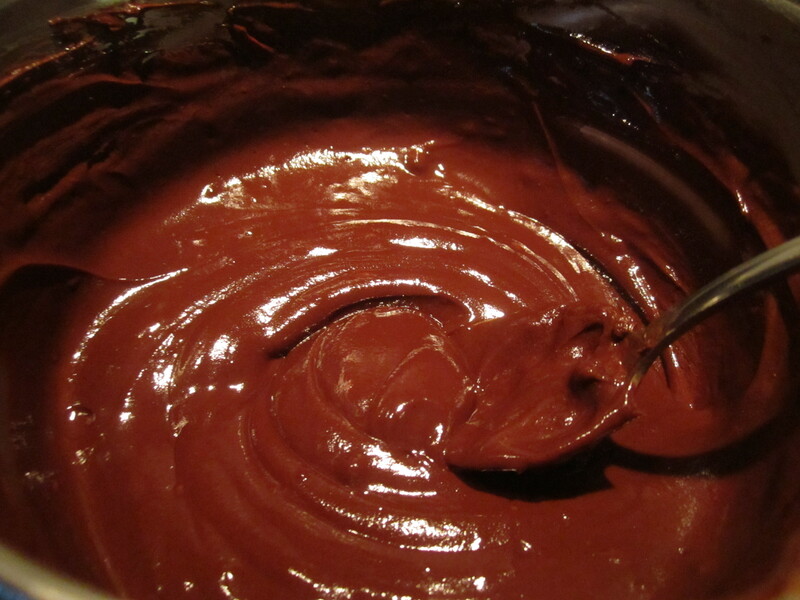 Remove the ganache from the fridge and bring to room temperature – though highly viscous, it should still flow. 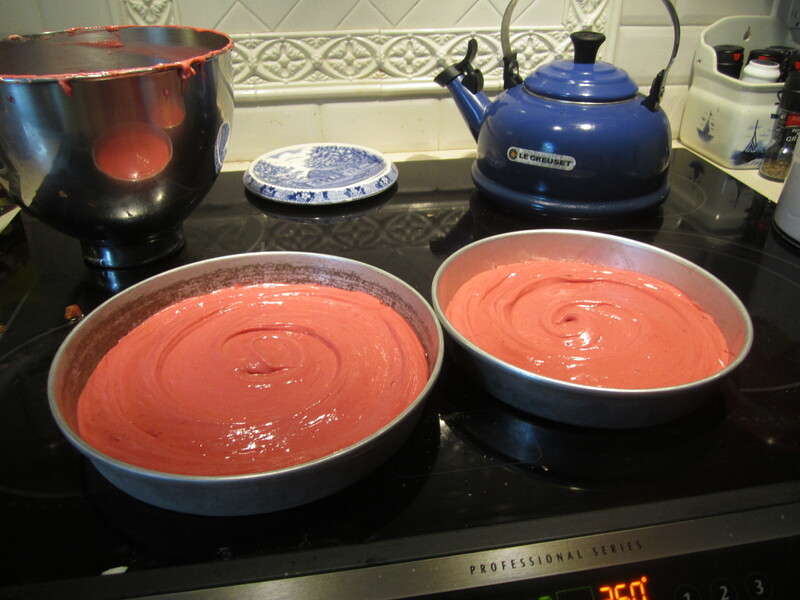 Pour overtop the third layer of cake, again leaving a little border by the edge so that it will ooze properly. Cover with the final layer of cake. 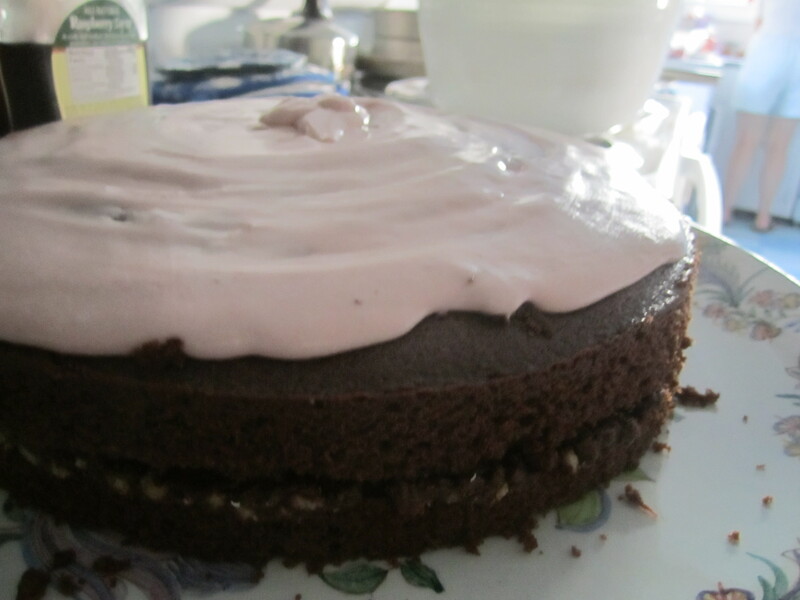 Get the chocolate buttercream and cover the cake, being sure to spread overtop the sides before adding more to the top. Decorate with raspberries. CUT AND SERVE, preferably with a glass of ice cold milk OR fresh-brewed coffee. 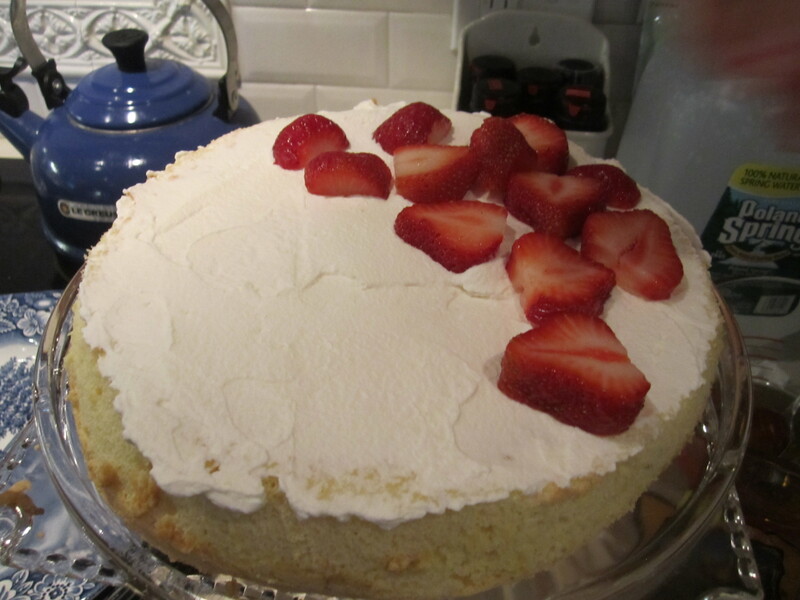 In any case, my sister found this gorgeous cake recipe that I figured we had to try as it featured strawberries as the star. 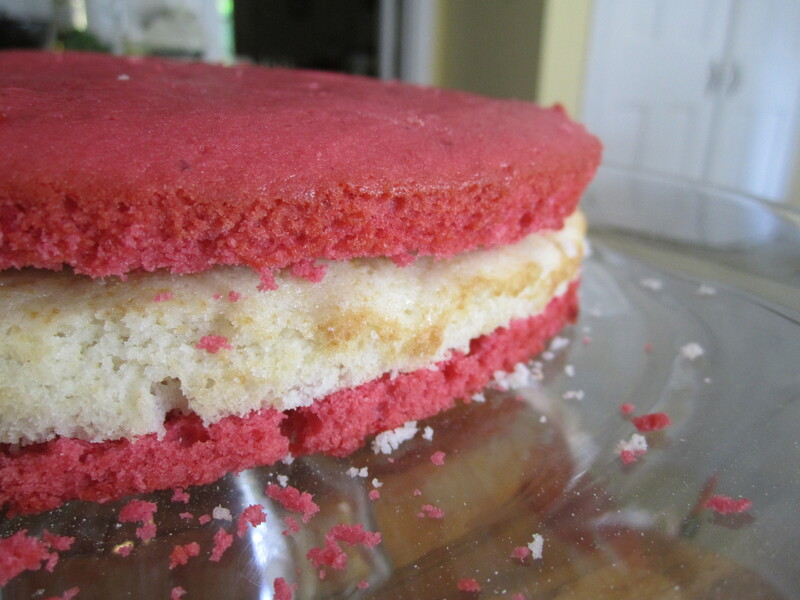 It is a riff on the French “fraisier,” a creation that is creme and strawberries between layers of thin yellow cake. 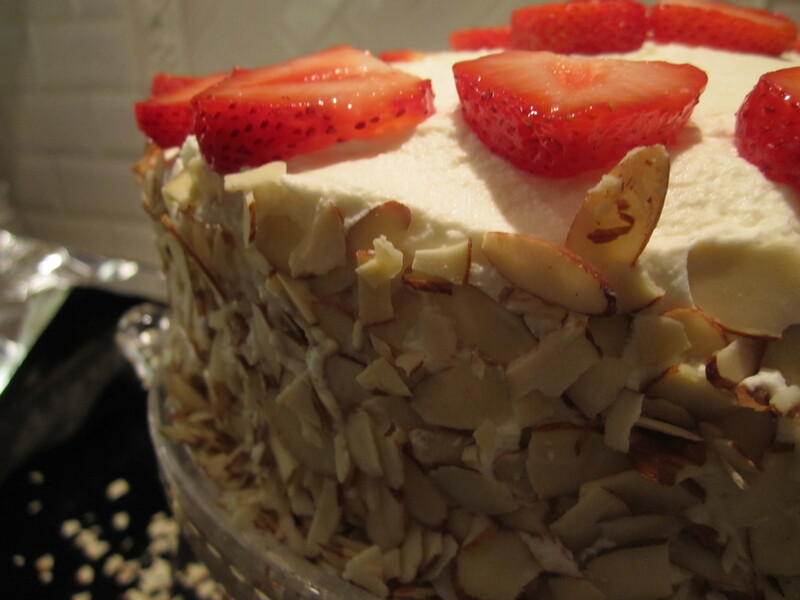 Our spin uses a very light sponge cake with a rum glaze, whipped cream and strawberry filling smothered in sliced almonds. For a summer night, it’s essentially perfect. Preheat the oven to 350F. 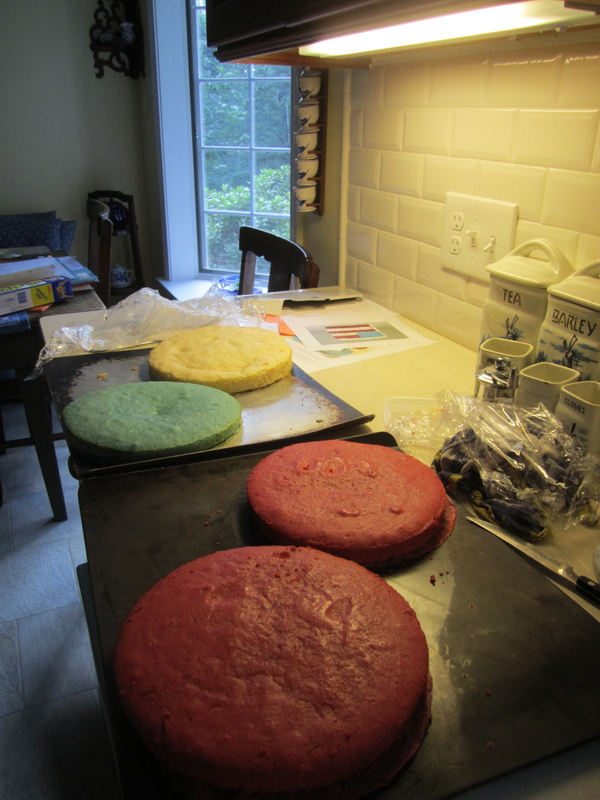 Prepare two 9-inch round cake pans – I usually use parchment paper to line my pans but I’m all out…so wax paper will have to do. It usually works fine but can be a little tricky if you let the cake cool in the pan. You have been warned. Separate the eggs, putting the whites aside for later and placing the yolks in a large mixing bowl. 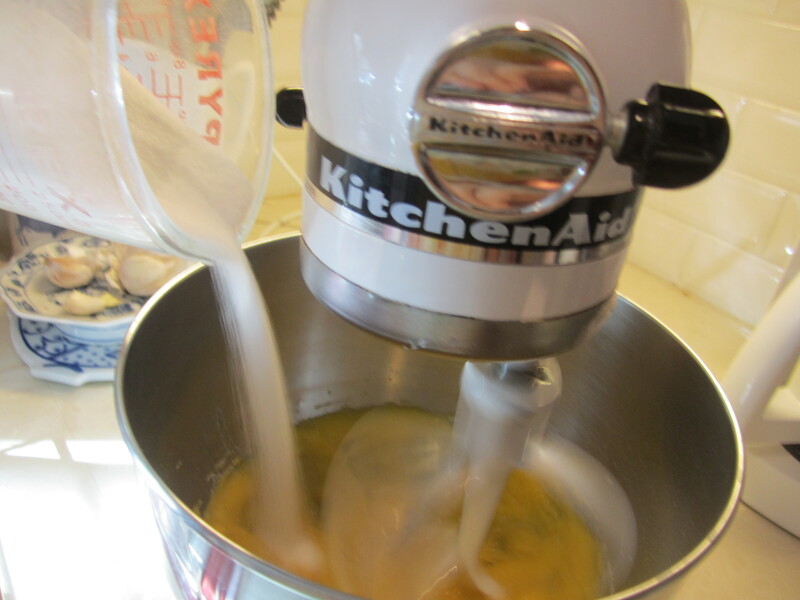 Add the vanilla and turn on mixer to medium speed, beating the yolks. As they start to change color, pour the sugar in slowly. 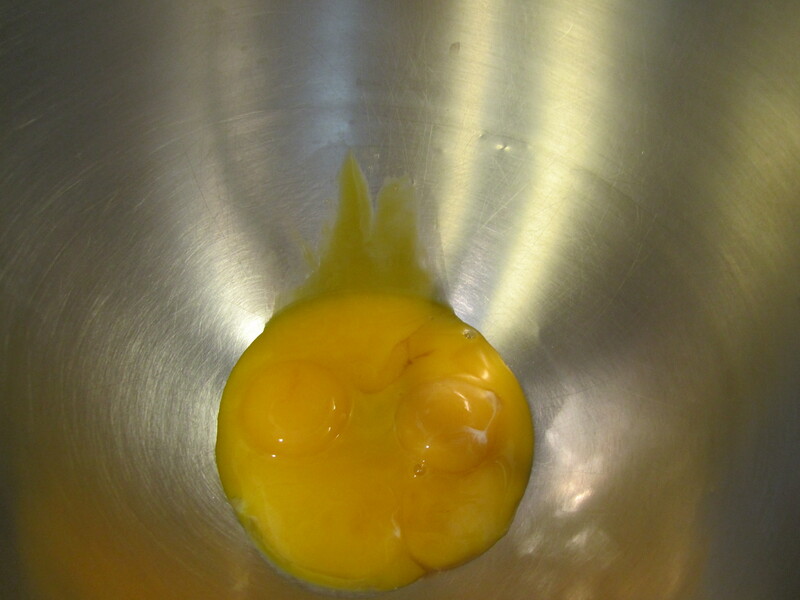 Beat until the yolks take on a light, lemony yellow color. This is called ribboning, a process where you beat air into the yolks and dissolve the sugar. When the egg mixture cooks, this intense beating keeps it from turning grainy. Add the water and the flour, mixing until just combined – no more. 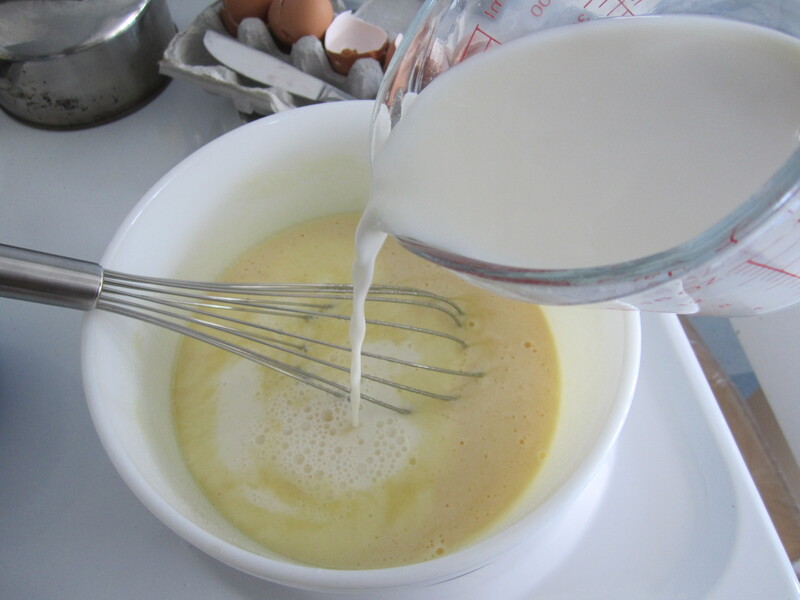 The batter will be mixed more when the egg whites are added. 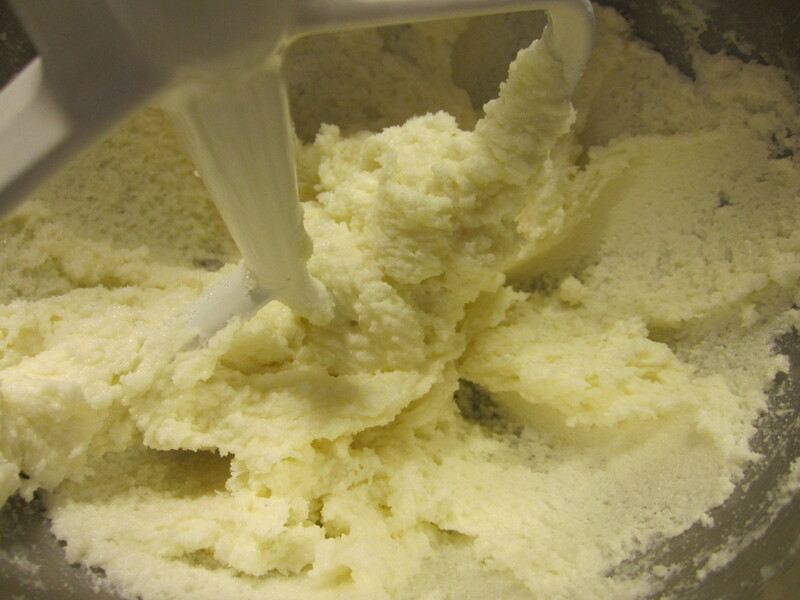 Speaking of egg whites…in another bowl, combine salt, cream of tartar, and egg whites. Beat on high until stiff but not dry. 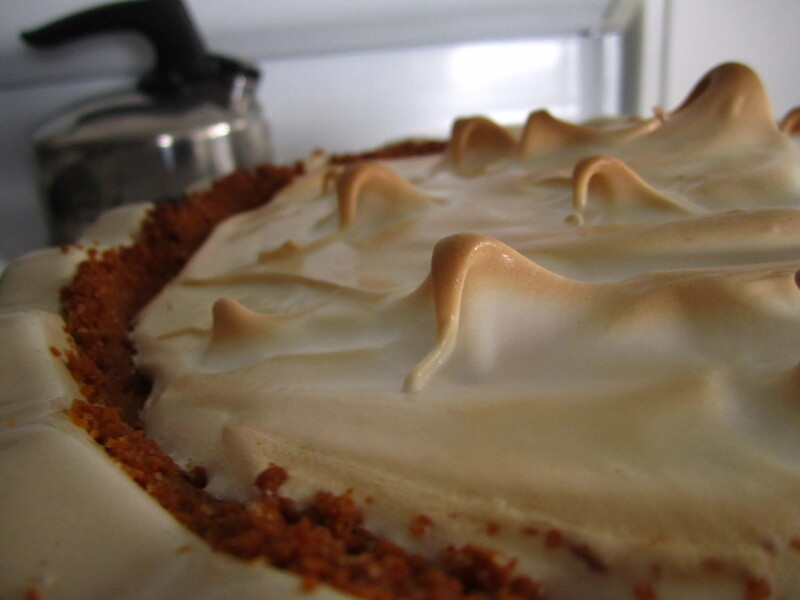 They should form peaks that hold all on their own – like little mounds of snow. When eggs are beaten, the proteins in the white are sort of…taken apart and put back together again in such a way that the eggs hold air bubbles really well, allowing them to double in volume. 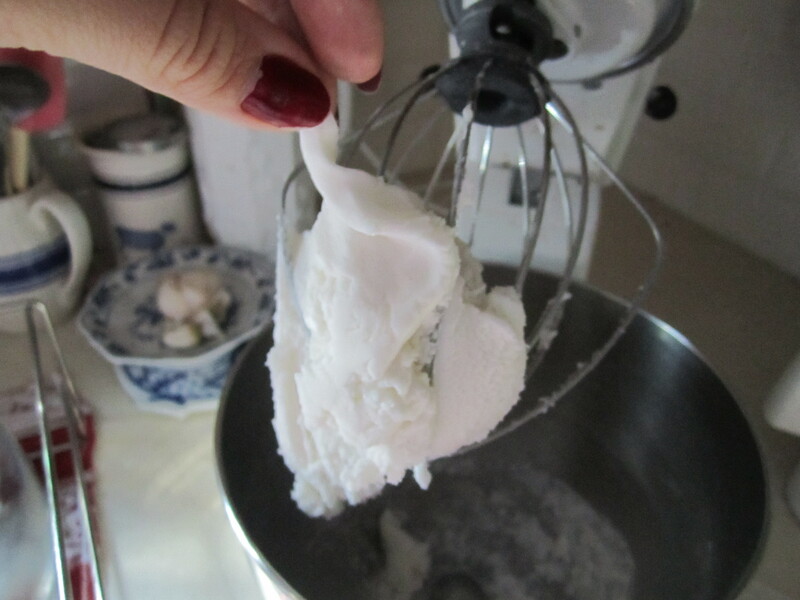 Fold the egg whites into the batter, being careful not to over mix. 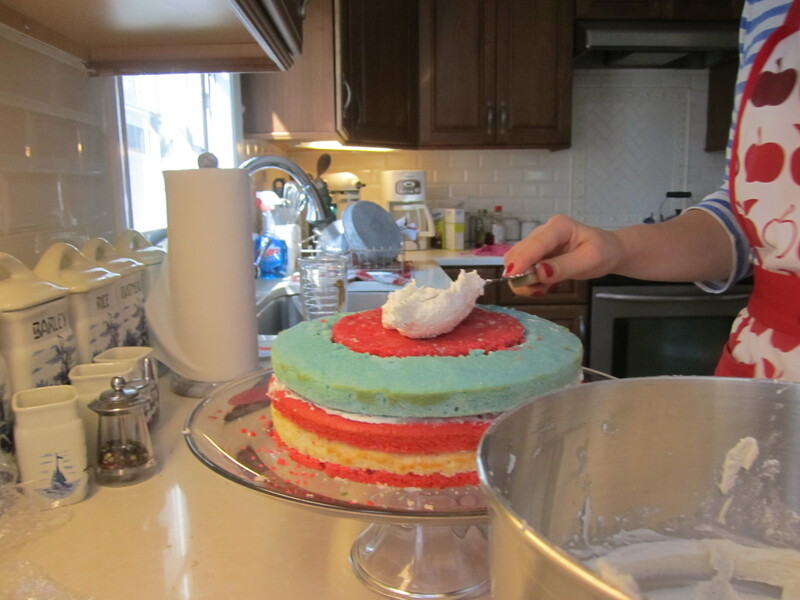 The whites add the spring to the cake and will give it that “spongy” texture. Pour into the pans and bake for about 20-25 minutes and golden brown on top. You’ll know they are done when you can poke them with your finger and the cake bounces back. Let cool. 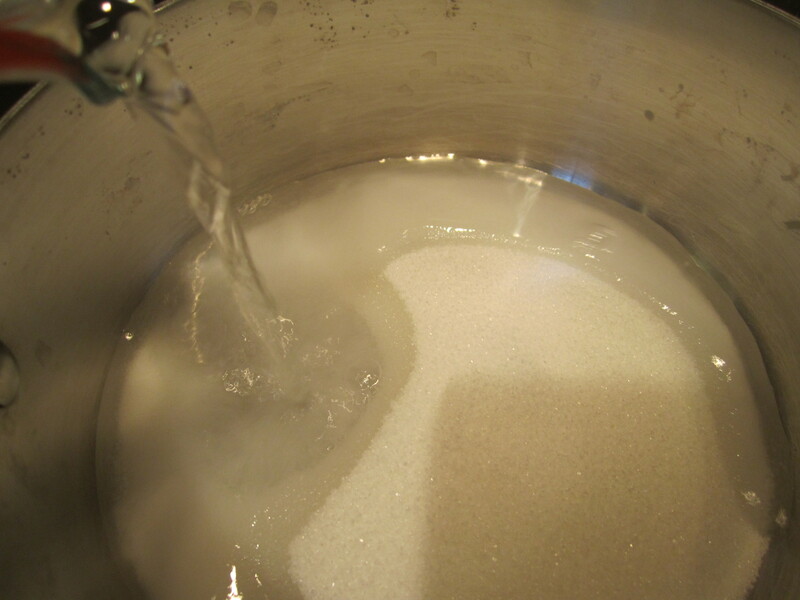 Pour the sugar and water together and boil over medium heat until everything is dissolved. Add rum. Set aside and let cool. Prepare your bowl by placing it in the freezer before pouring the cream in. Beat on high speed, adding the sugar and vanilla while mixing. 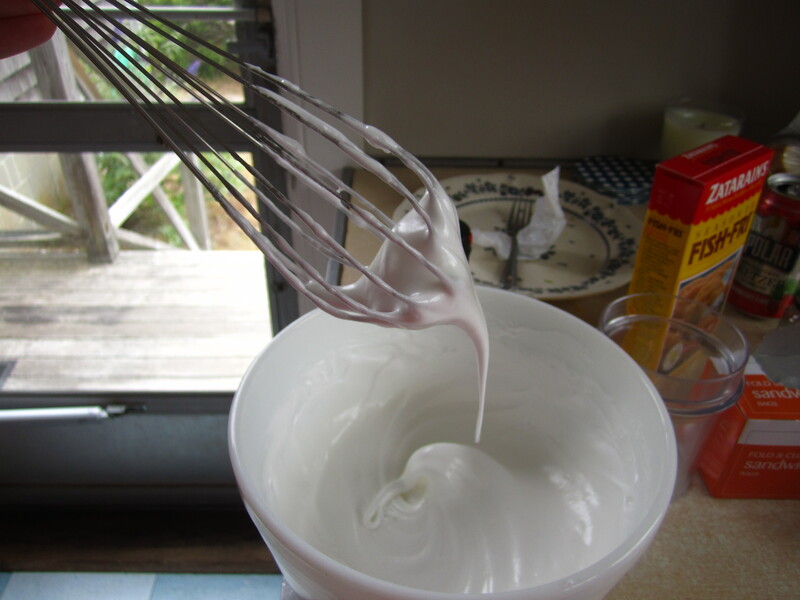 The whisk beats in air to the cream, whose fat particles trap it and allow the cream to double (triple?) in size. Take one layer of the cake and place it on a cake plate (or platter…or something….). Paint the top with the rum syrup. I love this flavor, so I think adding plenty of it is a nice idea BUT if you aren’t a fan of rum, just paint lightly. 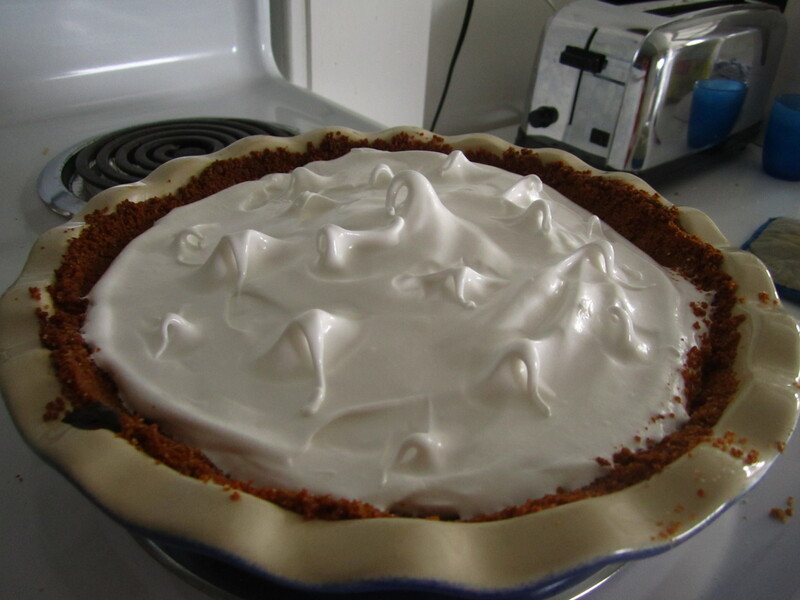 Place the whipped cream on top and smooth out. Place strawberries on top, being sure to distribute evenly. Put more whipped cream over those berries, followed by the second cake. 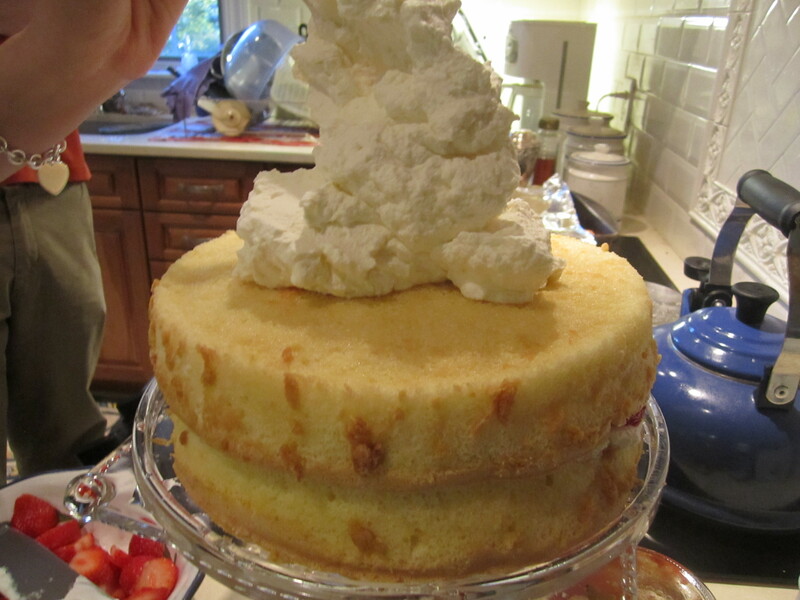 Again, paint with the rum syrup and then cover the entire cake with whipped cream. Plop the rest of the strawberries on top of the cake. We made a nice design but I think it would be just as lovely with a heaping pile of red, juicy joy. Slice and eat on a hot summer night…maybe after a daiquiri…or two. For the Americans poking around my blog, yesterday was Independence Day – a moment where the USA likes to tout its freedom and principles and set off fireworks (which is pretty entertaining). I’m not hugely patriotic and therefore am not entirely invested in this national holiday HOWEVER when my sister brought this cake to my attention, I couldn’t say no. It’s an ordinary, white, frosted cake on the outside…but a rockin’ STARS AND STRIPES (well..no stars…details details) gâteau on the inside ! 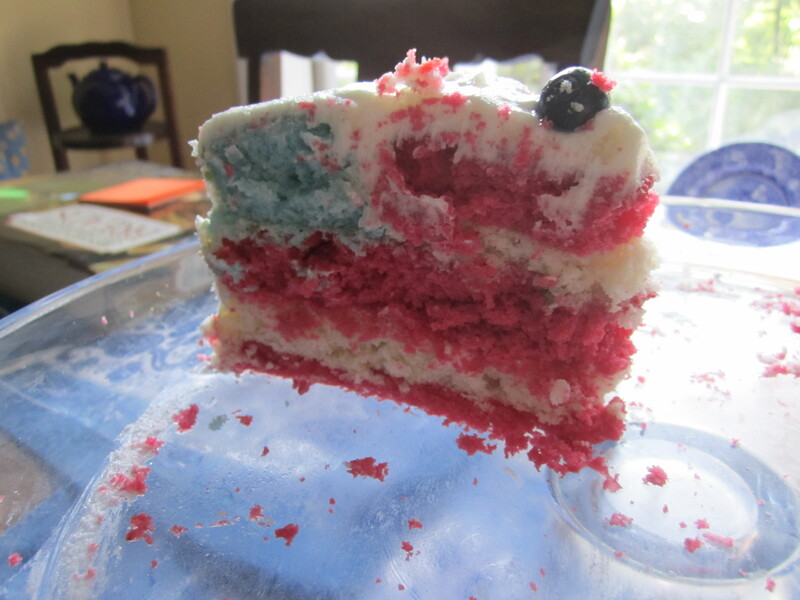 The actual source site for this “flag cake” à l’américaine doesn’t list recipes, so I used my own creations listed below. Again, this cake requires some serious dedication – you have to WANT to sculpt and craft this dessert, spending much time cutting and placing before being able to actually devour the final product so don’t tackle this project at 8pm. You’ll be busy until the wee hours of the morning. A little note on the cakes : The white and blue layers, both the same size, were made of the same base : a Lady Baltimore cake. 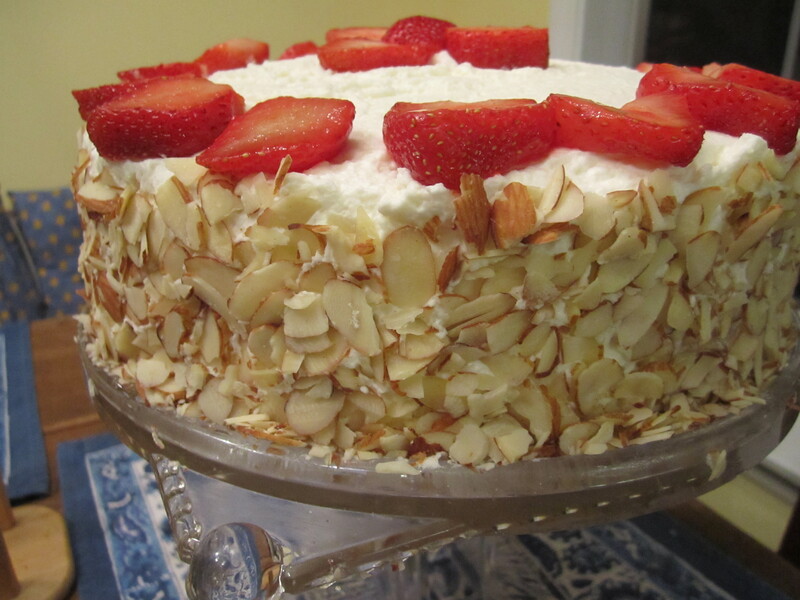 It’s a light, almond-flavored white cake that is easy to cut and handle given the egg whites. 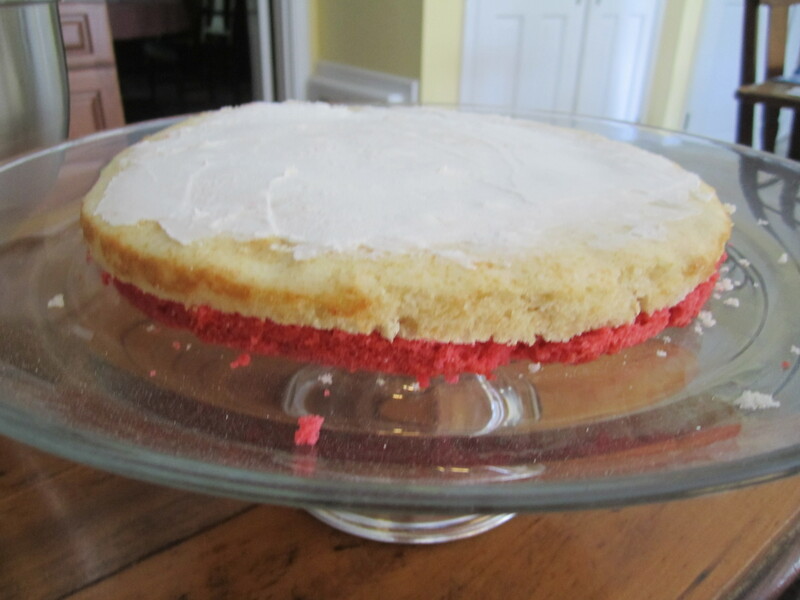 The red layer was a raspberry yellow cake recipe – this way, we didn’t waste any part of the egg, utilizing the yolks in this cake recipe that remained from the Lady B cake. 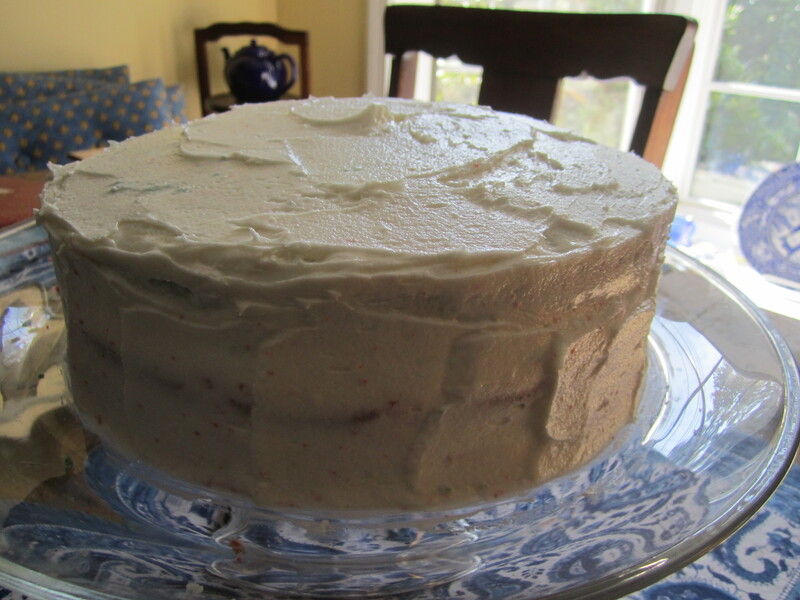 I added Chambord and raspberry jam to help both with the color of the cake and give it that raspberry flavor. 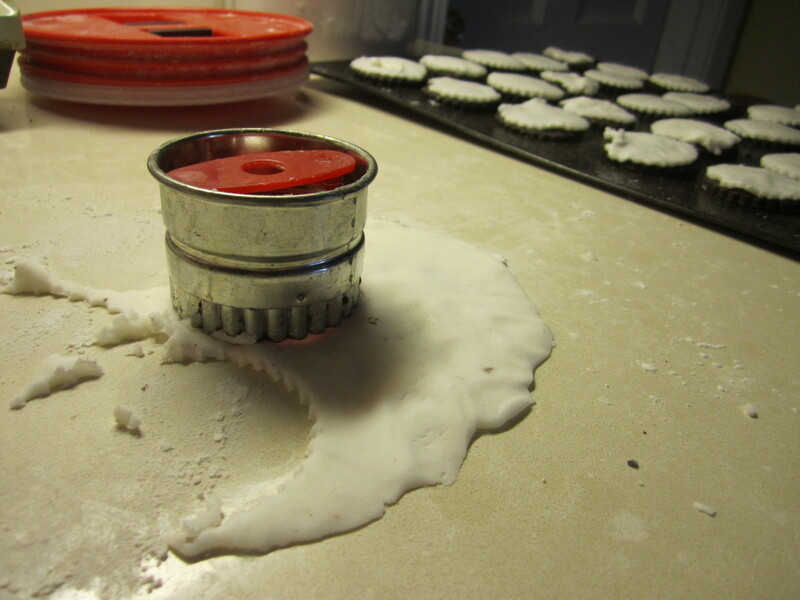 The frosting is an almond buttercream. Preheat oven to 350F. Line two 9-inch pans. Cream the butter and sugar together until light and fluffy. 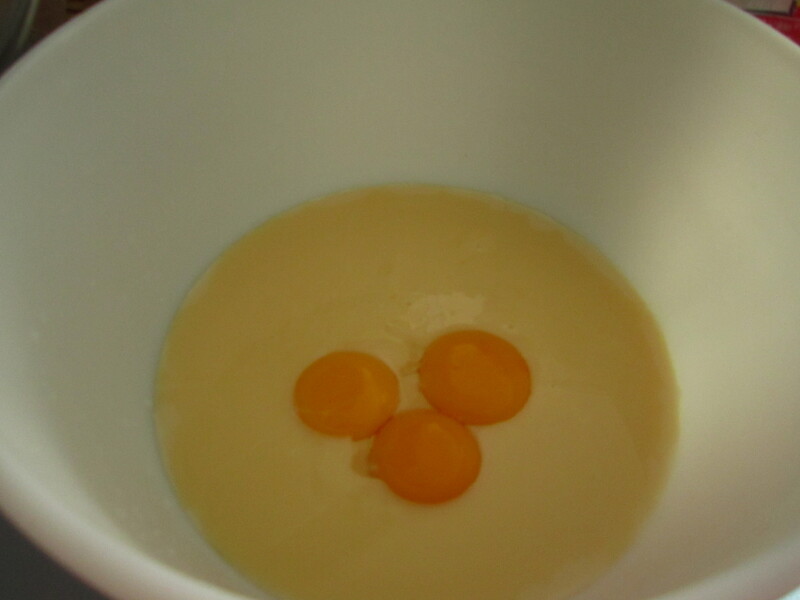 Separate the yolks and whites of three eggs. Add the vanilla, followed by the egg yolks. 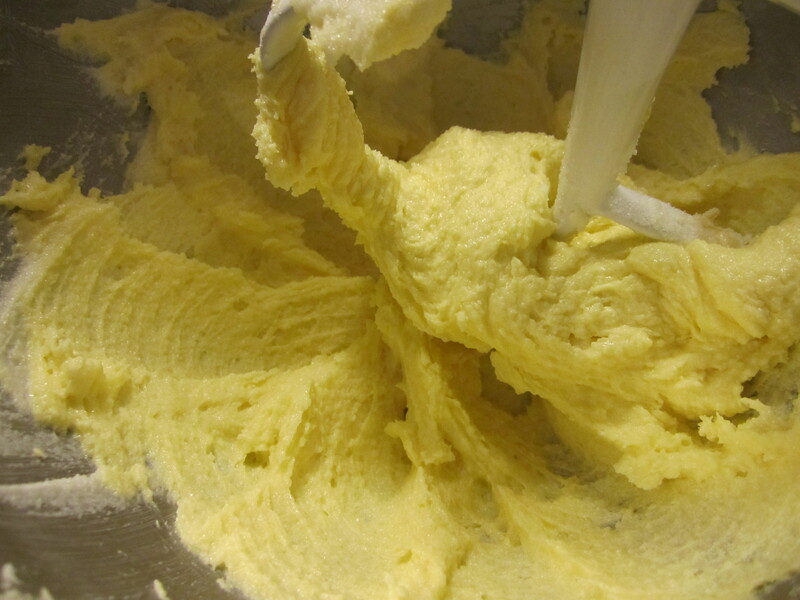 Beat well after each addition until the batter is nice and…homogenous. Add the milk and flour together, stirring until just combined. 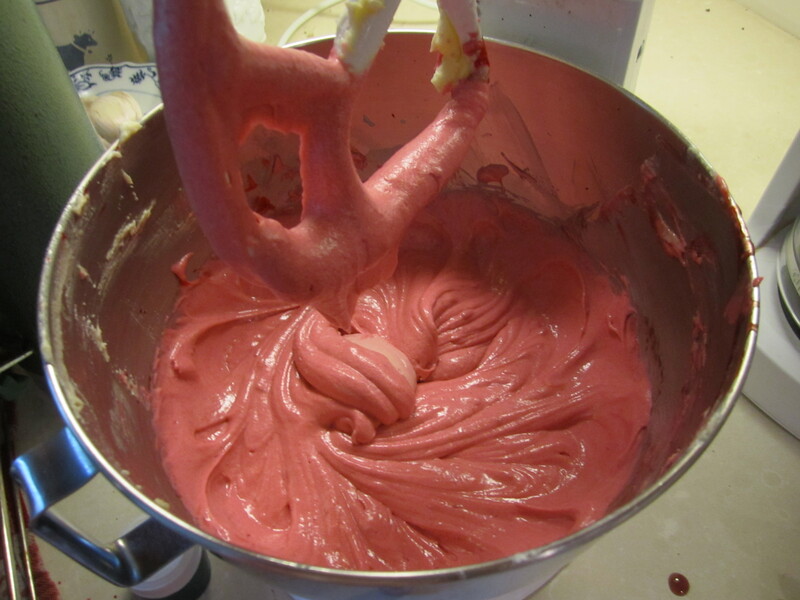 Add the jam and the chambord and the food coloring, mixing until the red is well-distributed throughout the batter. Pour into prepared pans and bake until springy to the touch – about 20 minutes. Preheat oven to 350F. Cream the butter and sugar until light in color. Add the vanilla and almond extracts. 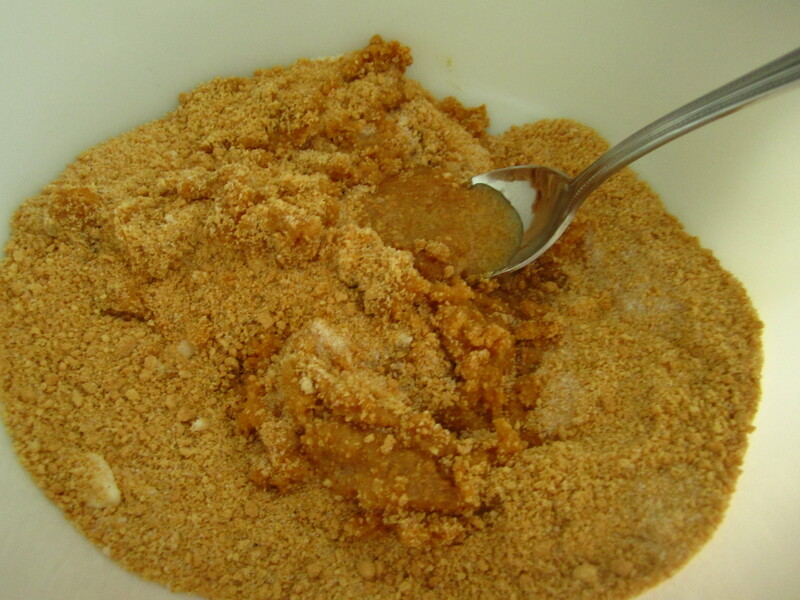 Mix in the flour, baking powder, and milk at the same time, being careful not to over mix. Set this bowl aside. In a clean bowl, beat egg whites until stiff but not dry. You can add salt or cream of tartar to the whites in order to help them whip up…but I usually skip that part. 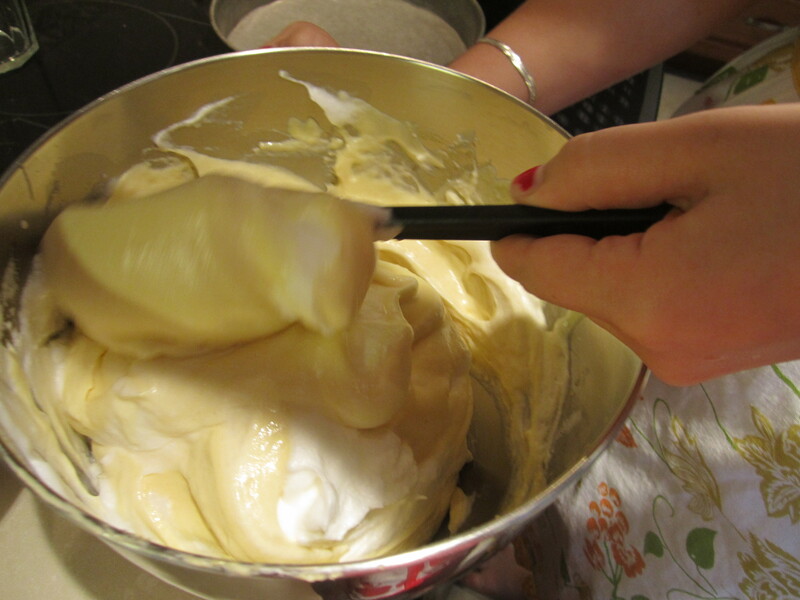 Fill the white cake pan with batter. 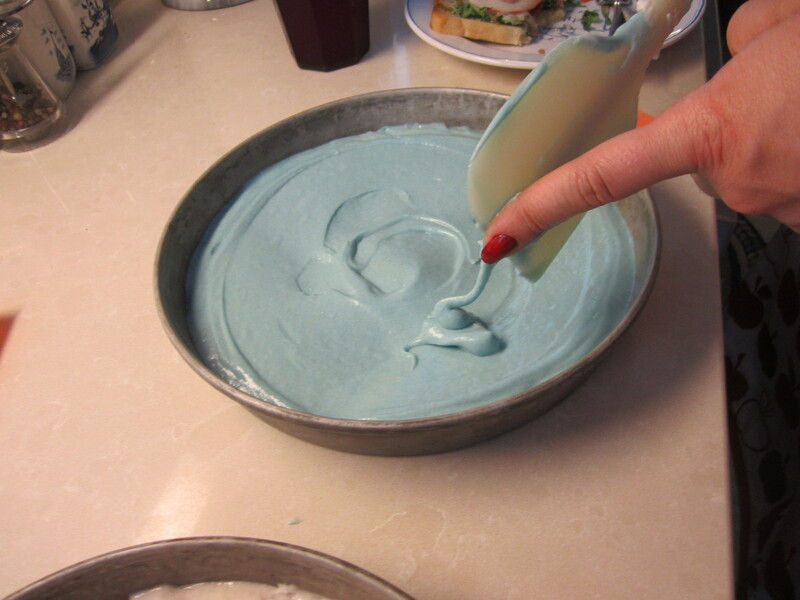 To the remaining batter, add LOTS AND LOTS OF BLUE FOOD DYE. 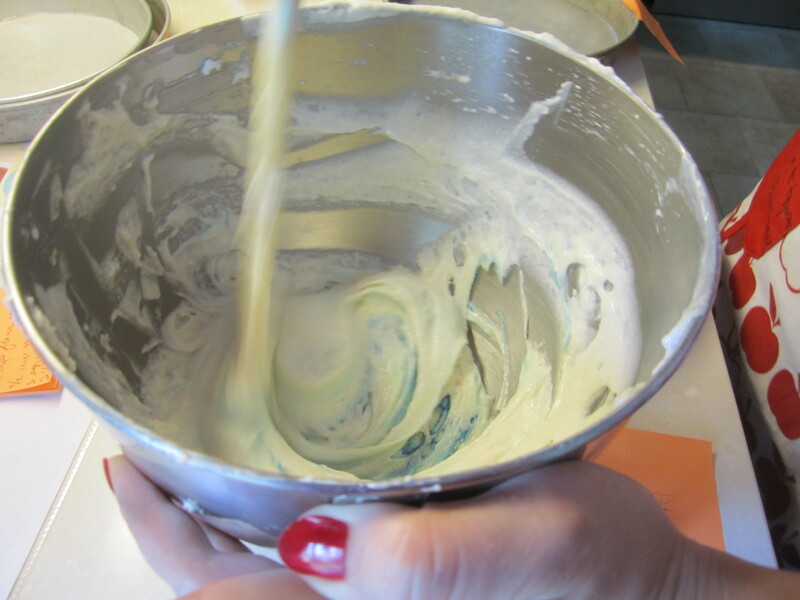 Mix until combined; pour the blue patter into the cake pan and place both pans in the oven. Let cook until springy to the touch – about 20 – 25 minutes. Beat the butter until nice and creamy. Add the sugar, watching the consistency. Throw in the extracts. Taste LOTS AND LOTS AND LOTS to make sure it isn’t too buttery/sugary/etc. If you find it to be too thick, add some milk – about 1 tbsp. 1. Using the lid of a canister of oatmeal (a circle between 4 to 5 inches in diameter), cut the BLUE LAYER so the it looks like a doughnut. Use this same circle to cut one of the RED LAYERS down to size. This RED LAYER will fit inside the blue layer. 2. 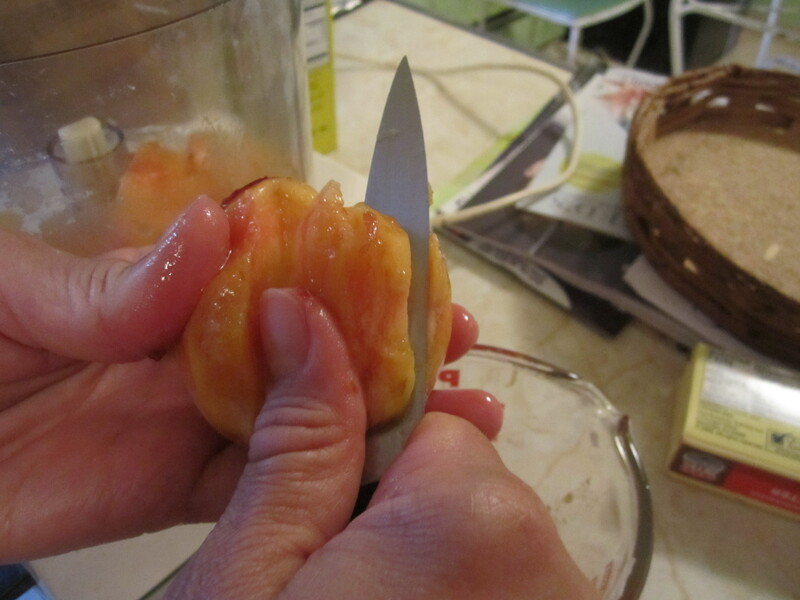 Cut the other red layer IN HALF – you can do this by using a wire like we did OR with a serrated knife. 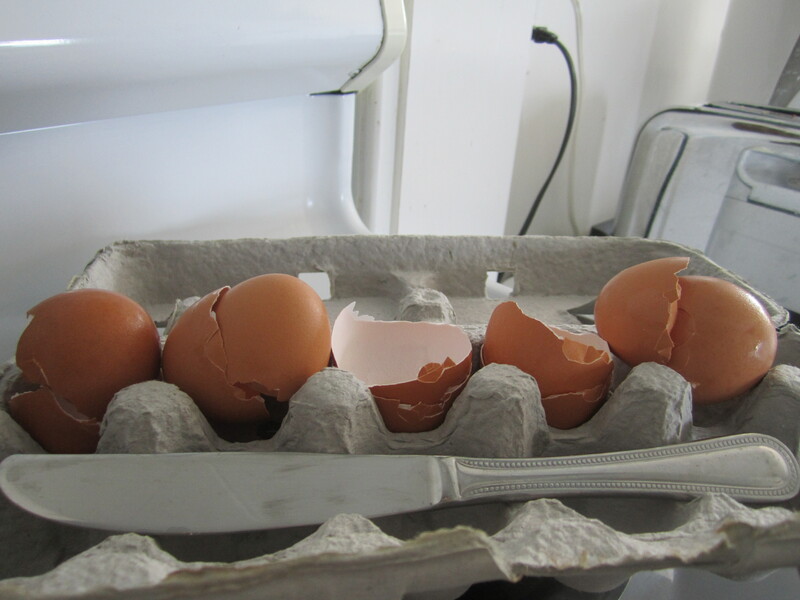 It’s a little stressful, but these cakes are tolerant of cutting – yay eggs ! 3. Cut the white layer in half, too. 4. 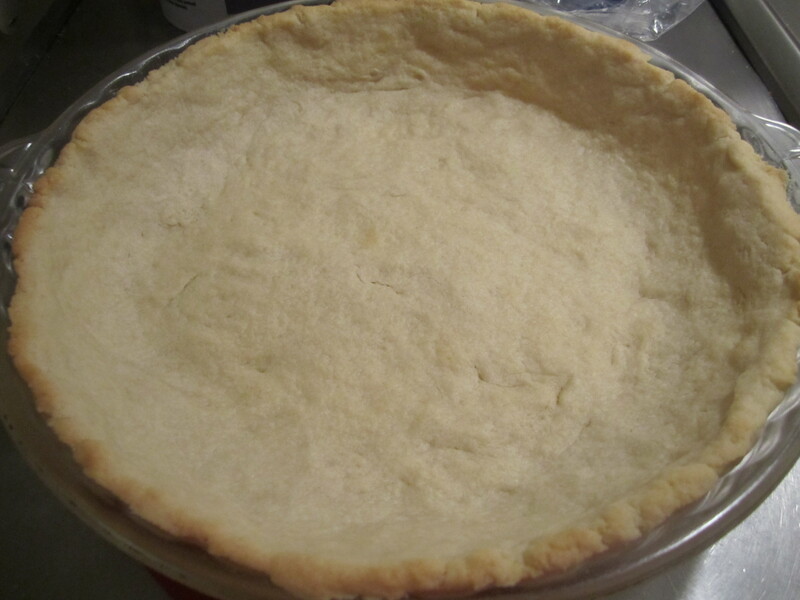 Take ONE of the thin white layers and cut it to the size of the smaller circle. 5. 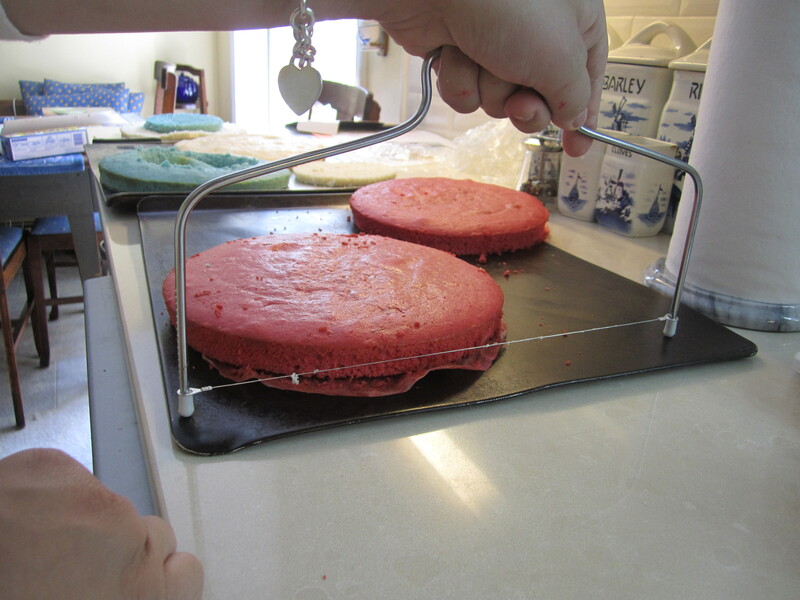 On the cake pan, lay the thin red layer first. 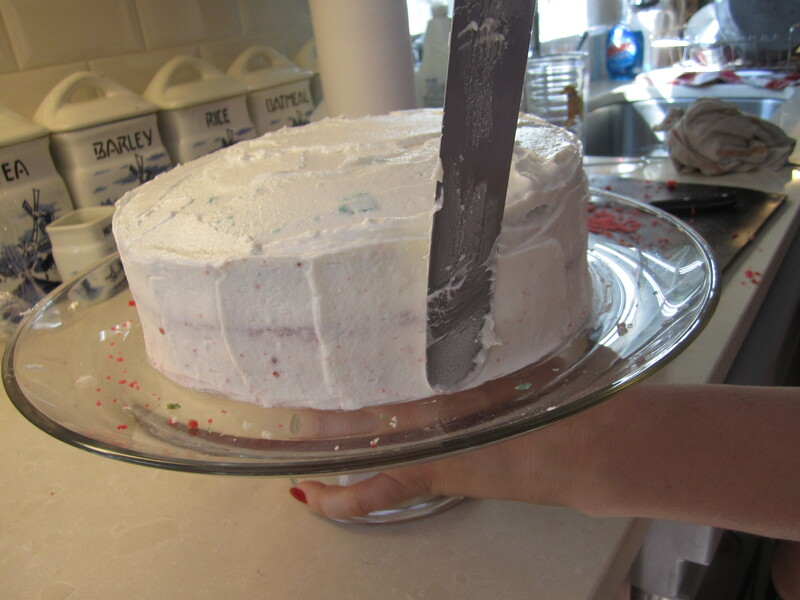 Spread a thin thin thin layer of frosting on the red layer. Cover with the thing white layer and some frosting. Then the red layer. 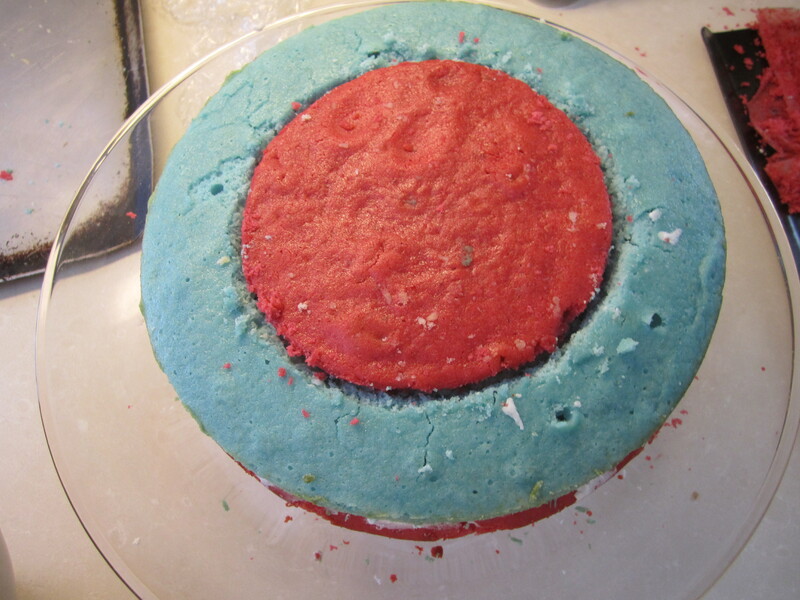 THEN THE BLUE DOUGHNUT, followed by the thin, small, white layer and then the small red layer. Here are some photos to help you visualize all of this. 6. Ice the entire cake. Yum. 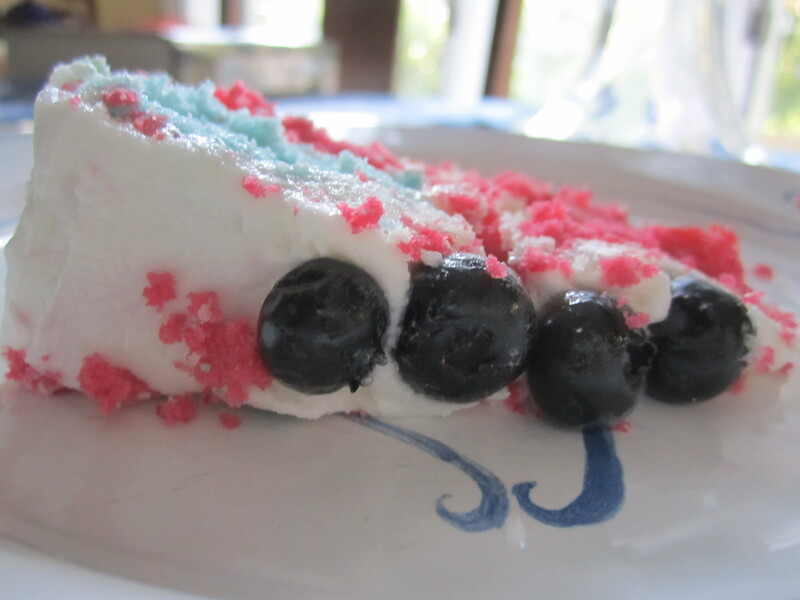 We put some blueberries on the top for decoration, but it’s fine all on its own, too. The layers of the cake work really well together and who doesn’t love a good surprise ? Happy (belated) Independence Day and bon appétit ! I usually am not a fan of packaged cookies…why ? BECAUSE they are easy (at hand, perfect for nibbling, pre-made, no stress, so simple…) and expensive (why, Nabisco, why ???) and full of unknown ingredients (preservatives ? Wax? Wood shavings ?). Mixing everything up by hand is just how I grew up (for the most part) and so boxed cookies are a “special event.” Social Teas and Le Petit Ecolier excluded. 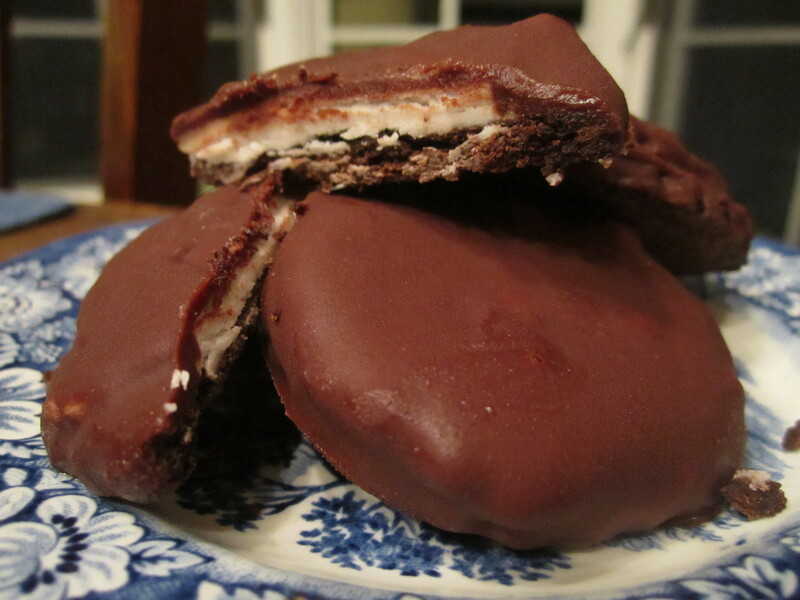 However…the other night, a friend of my family’s brought over these delicious little creations that are sort of like thin mints (those Girl Scout cookies that are über popular) and a peppermint patty. 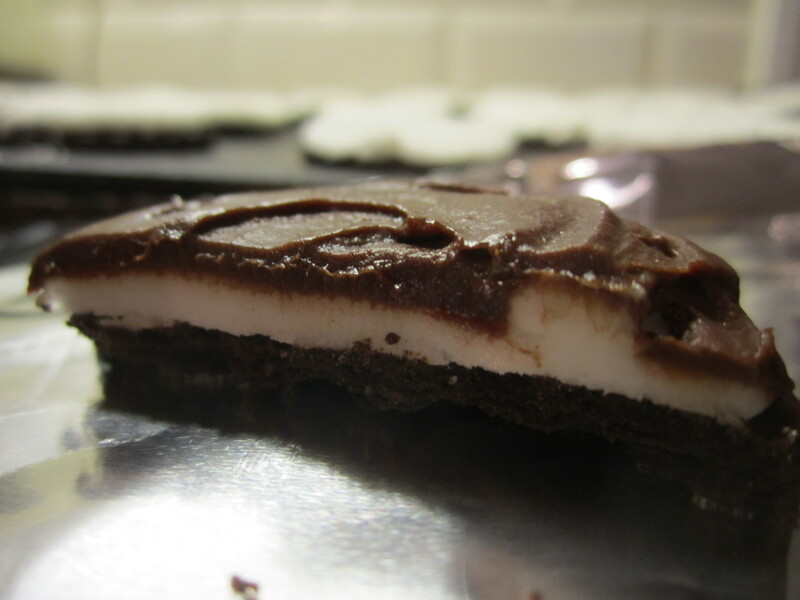 It’s a thin wafer cookie – the bottom of an oreo – with a layer of mint cream on top that is subsequently smothered in chocolate. On a hot night, these cookies are oddly refreshing…particularly when they come out of the freezer. 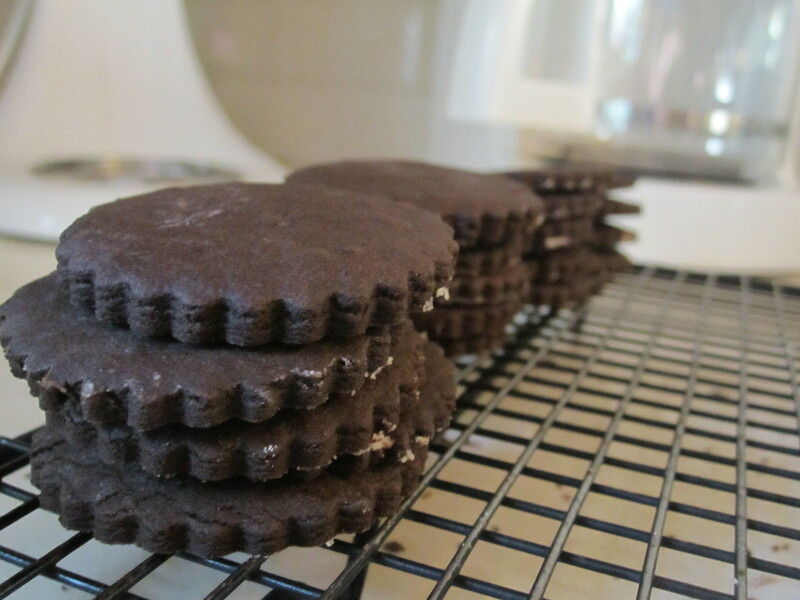 Somehow, I didn’t think my mother would be keen on buying Oreo’s latest creation, so I decided to make them myself. It’s surprisingly simple HOWEVER BE WARNED : This recipe takes time. Each individual component is easy to make, but the process of assembling the cookies themselves is rather involved. If you have children who like helping in the kitchen (or a bunch of people who like rolling out dough and cutting it into shapes à la Christmas cookies…), then this is a great recipe. I promise you…it’s worth it. My sister says that these are the best cookies I’ve made to date in my life…given my love of baking, that’s a pretty regal compliment. Preheat oven to 350F. 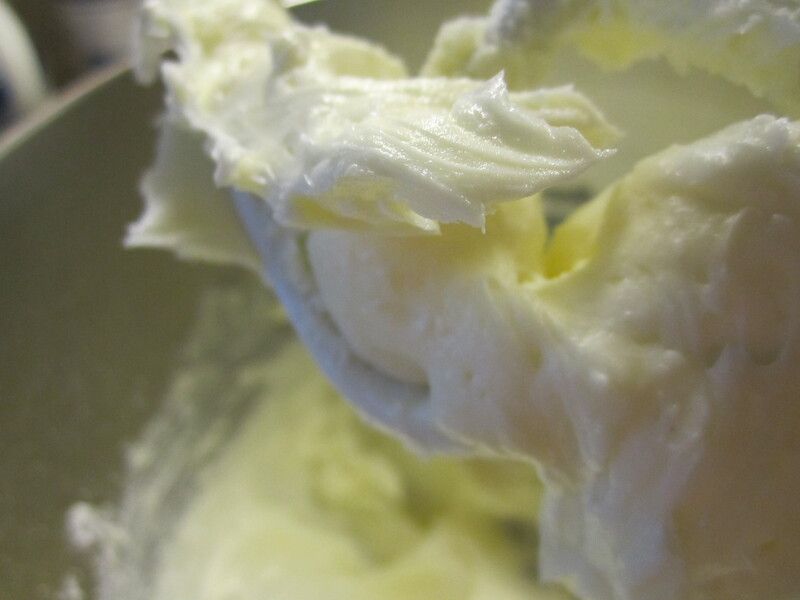 Cream butter until light and fluffy. Add the powdered sugar and beat again, keeping that fluffy texture. Add the cocoa powder and watch out for cocoa clouds! Stir in vanilla. 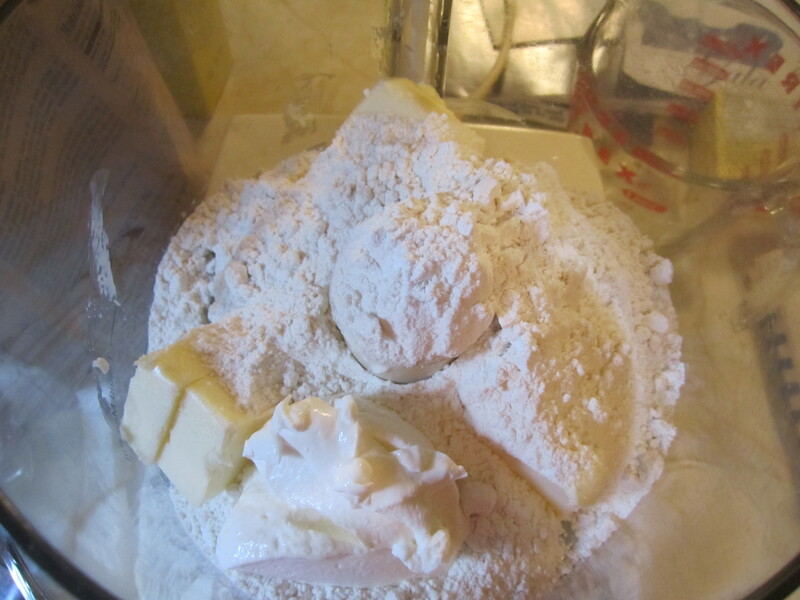 Add the flour; combine until the dough forms a ball. Knead on countertop before putting it in plastic wrap. 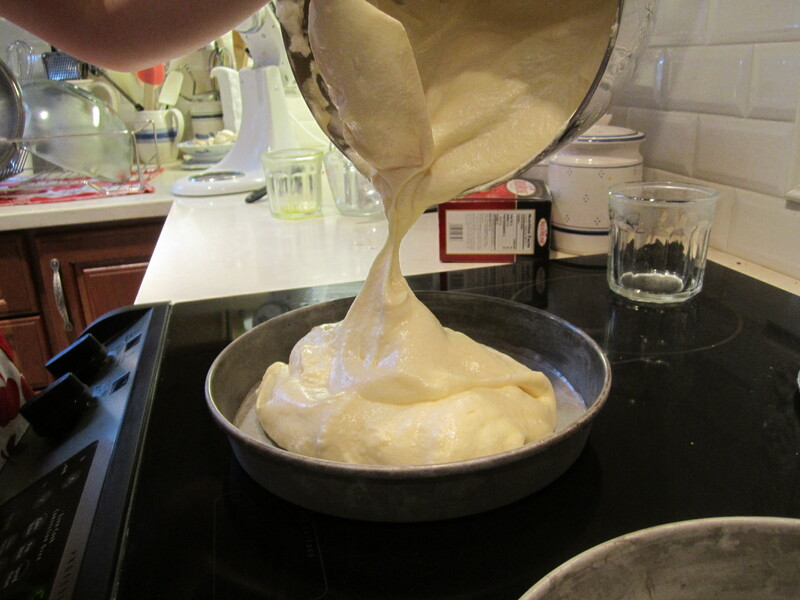 Allow the dough to chill in the fridge for 1 hour (or in the freezer for 15 minutes). 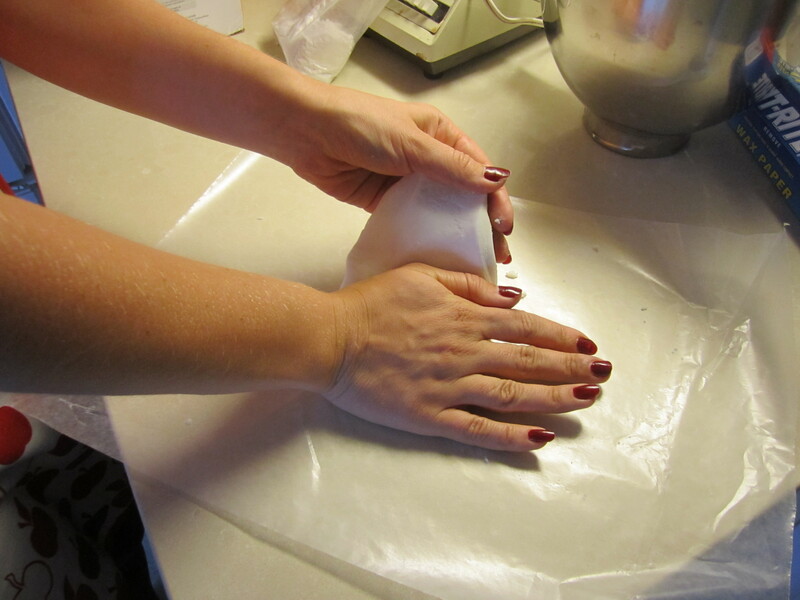 Roll out the dough on a well-floured surface and cut into rounds. Place on a baking sheet (the cookies won’t rise) and cook for about 10 minutes. 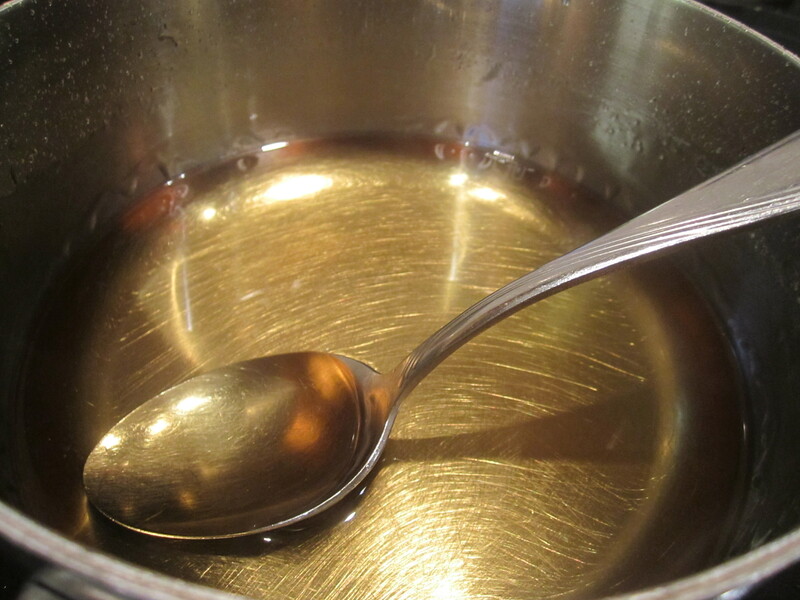 Combine the 2 1/4 cups sugar, the corn syrup, water, extract, butter and salt and beat until combined. It will be quite malleable. 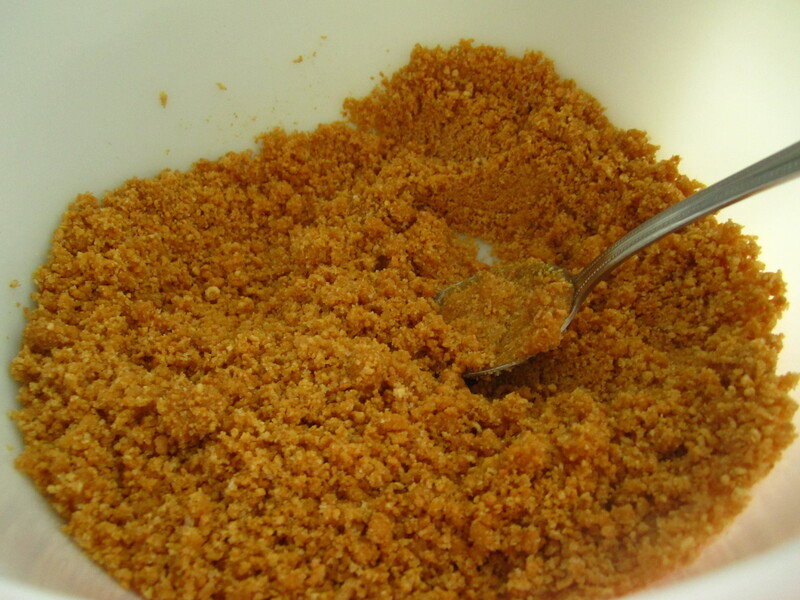 Dust work surface with remaining sugar and pour mixture overtop sugar. Knead until smooth – it only takes a few turns. 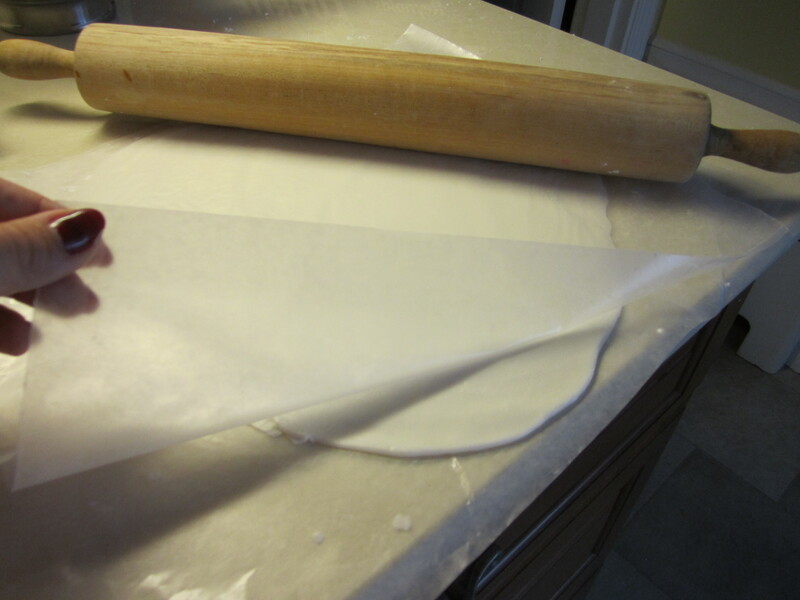 Roll between two sheets of parchment paper until about 1/4 inch thick. 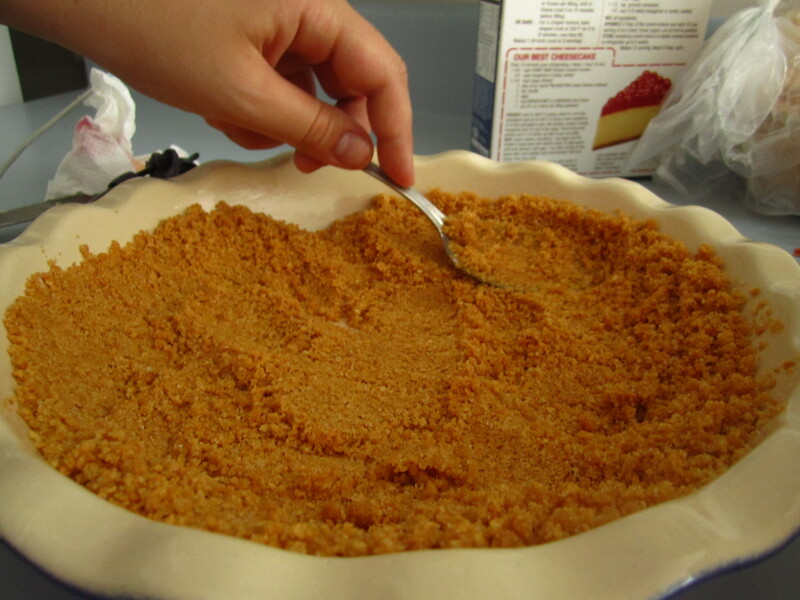 Freeze until firm – about 15 minutes. 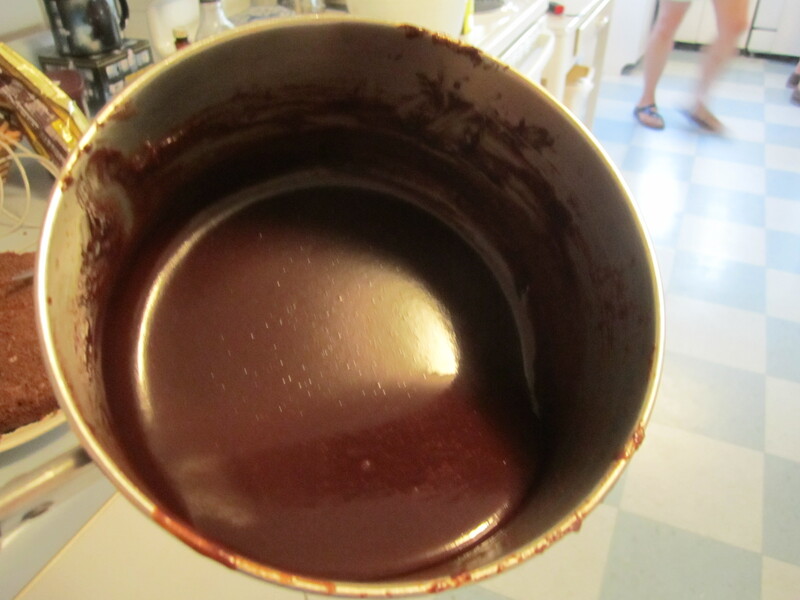 Melt the chocolate and butter over the stovetop on LOW HEAT. 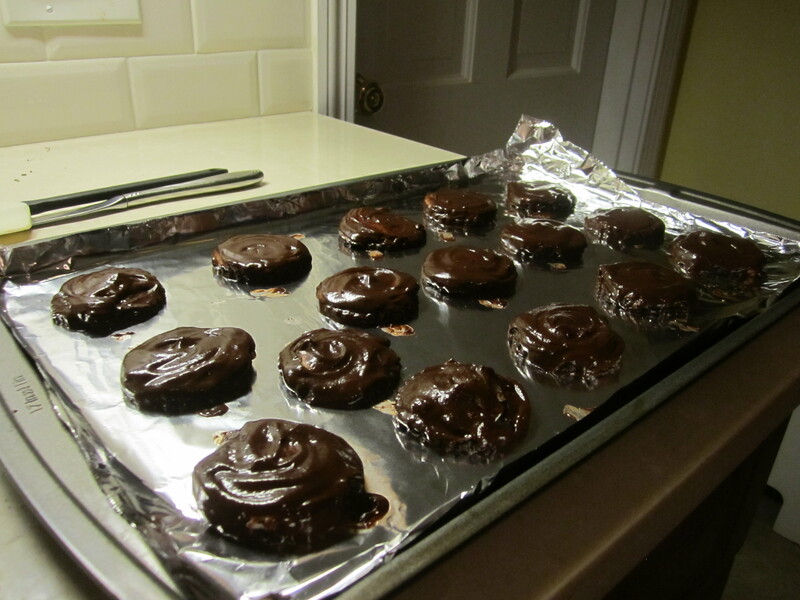 When the cookies have cooled, lay them on out a baking sheet covered with tin foil. 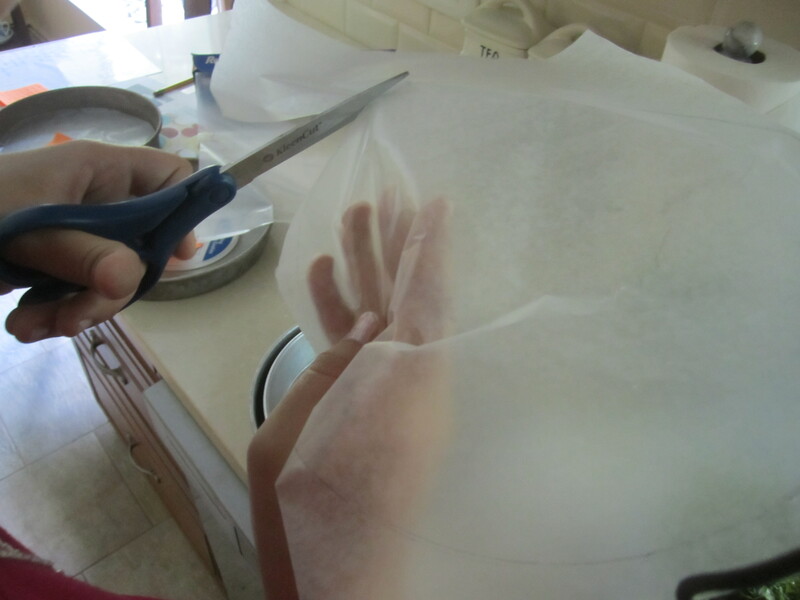 Remove the mint filling from the freezer and place on countertop (peel off parchment paper). If your kitchen is warm and the filling starts to get sticky, place in the freezer again before covering with the melted chocolate. Store in the freezer and laugh in the face of Oreo !